Here are our top picks for the best ceiling speakers that have very good sound performance and deliver exceptional value for money. These ceiling speakers are designed to transform your living room or home theater studio into a true cinematic experience with crystal clear highs, detailed midranges and good bass response. Our experts tested over a hundred ceiling speakers to determine which ones are the best and have the best combination of sound quality, price and design. Here is our updated list of best ceiling speakers that definitely perform above the competition and come highly recommended, so be sure to check them out! 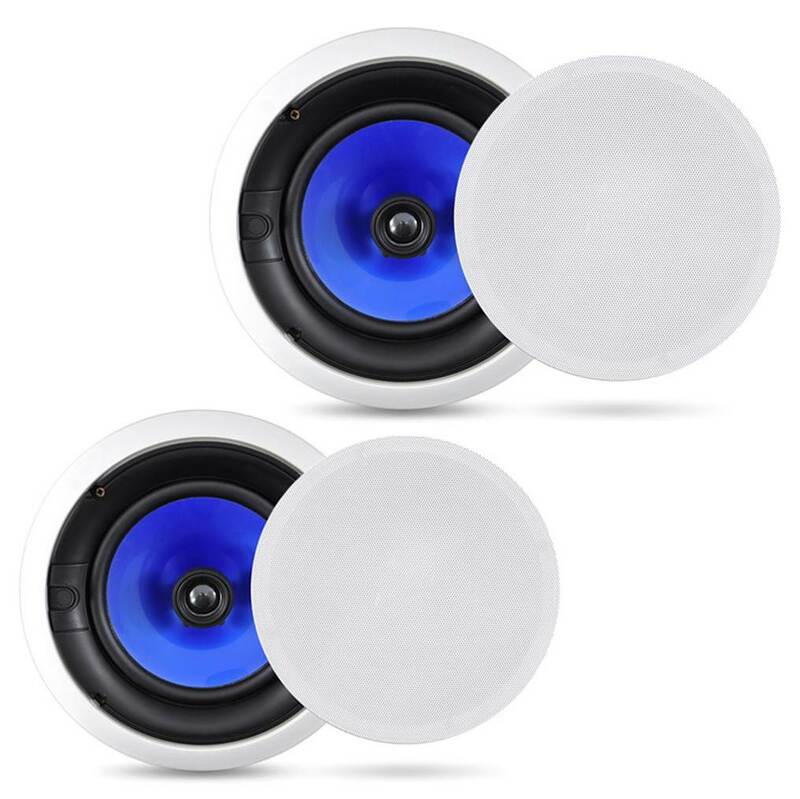 We have also previously reviewed the best Bluetooth ceiling speakers you can find on the market – if you are looking for ceiling speakers with Bluetooth connectivity, this list is something you should check out. We choose the best ceiling speakers based on a combination of factors including sound performance, design, price and durability. Our experts have tested numerous ceiling speakers to determine which ones represent the most value for money and are definitely worth the investment. Because ceiling speakers are acoustic equipment that you would want to install for the long term – bearing in mind that you might have to make structural changes to your ceiling just to install them – we ensure that we pick ceiling speakers that are durable and produce really good sound performance. Some of these ceiling speakers also work very well in a full 5.1 or 7.1 configuration, providing a truly surround sound experience in your room. The Polk Audio RC80i is undoubtedly one of the best ceiling speakers you can find that delivers exceptional value for money. They come as a pair of 2-way in ceiling speakers which are timbre-matched for sonic imaging and enhanced audio fidelity. It comes equipped with one 8” dynamic balance, mineral filled polymer composite cone and one 1” dynamic soft dome tweeter for extended highs and a 15 degree swivel mount for you to angle the sound projection. The Polk Audio RC80i is capable of producing full range sound with a wide frequency range of 35Hz to 20kHz and has superb sound clarity. It is also constructed of durable moisture resistant materials which make them suitable for installation in kitchens and outdoor patios, although they should not be directly exposed to the outdoor elements. We liked the fact that the RC80i also features a tweeter switch that enables you to adjust the highs for your room environment; the swivel-mounted tweeter is amiable for allows you to create the perfect soundstage in your living room or home theater space. Overall, the Polk Audio RC80is are among the very best ceiling speakers you can buy and we highly recommend them. The sound performance of the Polk RC80i is very impressive. They produce very nice extended highs and have a timbre range that adds a layer of sparkle to the music, making vocal and instrumental music sound really crisp. The midrange is present and sounds sweet and well defined, allowing you to listen to details in the music which you might not have noticed before. The sound clarity from the RC80i speakers is crystal clear from low to mid volume levels; you can crank up the volume on these speakers but they will start to distort a little at maximum volume. That being said, they still sound exceptionally clear at lower to mid volume levels without any issues. The bass response from the RC80is is decent but you will need a dedicated subwoofer in the system to push up the lower end bass response. Vocal performances on the Polk RC80is sounded very clear and natural without any artificial coloration; instrumental music had plenty of soundstage and good musical separation that allows you to pick up the finer details in the music. If there is one word we would use to describe the Polk RC80is, it would be clarity – these speakers have plenty of sound clarity that makes them so enjoyable to listen to for hours. The Polk Audio RC80i ceiling speakers have a simplistic and minimalist design that blends in easily into modern home décor. They install easily into the ceiling or wall without using any floor and shelf space – all you need to do to install the speaker is to cut a hole, connect the ceiling speaker wiring and securely place the speaker in the ceiling hole. The RC80i automatically secures itself in place by rotating cams that do not require extra hardware or assembly accessories. It also comes with a paintable grille and flange that allows the ceiling speaker to be barely noticeable in the room once installed. The RC80i uses 8” dynamic mineral filled polymer composite cone with rubber surrounds for enhanced durability. It also features strong composite driver baskets that keep the sound components in rigid alignment and a wide dispersion design for better sound coverage. We also liked the fact that it comes with a swivel mounted tweeter that is rotatable 15 degrees for amiable sound projection for better sound imaging in your living room. On the whole, the RC80is is a really durable ceiling speaker that will deliver sound performance for many years to come – and come with fuss free installation instructions for easy setup. The Verdict? The Polk RC80i is one of the best ceiling speakers you can find that delivers exceptional value for money. The sound performance on the RC80i is definitely on par with mid-level audiophile expectations and produces really solid sound clarity. It produces very crisp highs, sweet midrange and a decent low end that adds a punch to the overall music performance. We liked the fact that you can rotate the swivel mounted tweeter to achieve a better soundstage and sonic projection. The RC80is have a really durable construction with rubber surrounds and are constructed with moisture-resistant materials which allow you to mount them on outdoor patios or bathrooms, although they should not be exposed directly to the outdoor elements. They are also easy to install, and come with paintable grille and flange that allows the ceiling speaker to blend into your home environment. They are the overall best ceiling speakers we have encountered and are definitely worth checking out. The Pyle PDIC60Ts are 2-way stereo sound speakers and some of the best ceiling speakers that deliver exceptional value for money for the price. If you are an audiophile looking for a good set of ceiling speakers at a value price point, the PDIC60Ts will not disappoint. They are 6.5” speakers with an 8 ohm impedance and 1” high temperature voice coil for enhanced sound performance. The PDIC60Ts come with an adjustable 1” titanium dome tweeter with 250 watts peak power for extended highs and rich sound. It also comes with a 70 volt transformer option depending on whether you require a standalone power source. Each ceiling speaker measures 6.5” round and delivers very good sound in your home theater or office environment without taking up space – they flush mount into the ceiling so they will be barely noticeable after installation. We are confident that the Pyle PDIC60Ts are some of the best ceiling speakers you can find that delivers very good value for money and come highly recommended. The sound quality of the PDIC60Ts is crisp, detailed and clear. They sound excellent straight out of the box and can easily fill up a small to medium sized room with rich and filling sound. When paired with a decent home theater receiver, these ceiling speakers can really push out deep sound effects and crisp dialogue which makes watching movies with these speakers a really enjoyable experience. Vocal performances sounded crisp and clear with well-defined midrange; the ceiling speakers do add a little sparkle to the music which gives an added boost the treble ranges. That being said, the bass response from the PDIC60Ts can be improved and will require a dedicated subwoofer if you truly want to add more bass into your overall listening experience. You will also need to tweak the equalizer settings on your receiver before you can get optimal sound performance with these ceiling speakers. The PDIC60Ts sound really good at mid-level to loud volume levels, but will start to distort a little at maximum volume. This was not an issue for us as we prefer to appreciate the music at mid-level volumes rather than blasting at full volume. Overall, we would say that the sound quality of the PDIC60Ts, while not the best we have heard, is really very good for a ceiling speaker at this price range and is definitely suitable for most home living room applications. The PDIC60Ts have a very minimalist and sleek design. Installation of these speakers was a very simple and easy process, and it also comes with screw tabs to get a tight fit on the ceiling enclosure. You also have the option of purchasing a separate 70V amplifier system at 8 ohms that is compatible with this system. Each ceiling speaker measures 6.5” round and is equipped with a 1” high temperature voice coil and directable 1” titanium dome tweeter for enhanced sound performance. It comes as a pair and has a maximum power output of 250 watts max. The twitter can be adjusted although do note that they have limited tilt range – we would recommend installing these speakers around 8 feet apart for the best soundstage. It has an overall dimension of 9” diameter and 4-5/8” depth. You can tell that the PDIC60Ts are made of really durable materials straight out of the box and good quality components that have a certain weight to them. They look really sleek when installed into the ceiling and flush mount which make them barely noticeable. The Verdict? The PDIC60Ts are definitely one of the best ceiling speakers that represent great value for money and are definitely worth checking out. They are really easy to install and come with 1” high temperature voice coil and 1” titanium dome tweeters for crisp extended highs and rich sound performance. When connected to our receiver, these speakers really deliver sound quality on par with higher-end ceiling speakers with natural sound reproduction and very good detailed sound. They can get really loud although they will start to distort at close to maximum volume – at half volume these speakers are already deafening so we don’t recommend pushing them at max volume. The ceiling speakers leans towards the treble ranges and produces a really nice sparkle in the music which is great for vocal and instrumental music performances; you might want to add a dedicated subwoofer to the overall system just to beef up the low end bass frequencies. They are also pretty durable and feel very premium straight out of the box. On the whole, the Pyle PDIC60Ts are highly value for money and are definitely a pair of ceiling speakers that will last for a long time after extensive use. The Micca M-8C is one of the best ceiling speakers you can find on a budget that delivers entry-audiophile sound performance. It is a 2-way in ceiling speaker with a high excursion 8” poly woofer for enhanced low end response and a 1” soft dome tweeter for extended highs. The tweeter and woofer are connected via a 6dB crossover network to achieve better sound performance and coordination. The M-8C is capable of producing smooth and natural sound with decent bass output for casual listening or integrated with home theater systems. 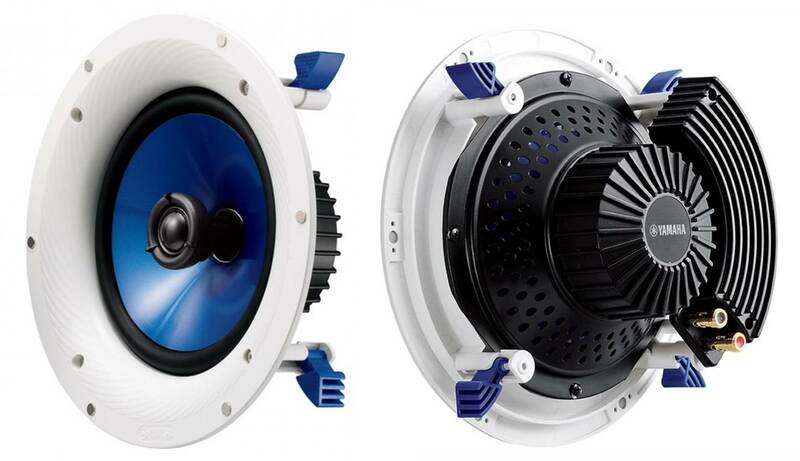 The 8” woofer delivers punchy bass output which means that you get more kick out of your music with these ceiling speakers; this might be ideal if you want a speaker system without the need for a dedicated subwoofer to enhance the low end frequencies. You can tell that the M-8C is built of high quality components straight out of the box and they are easy to install with a screwdriver – the mounting tabs automatically hooks onto the surrounding wall securely. Overall, the Micca M-8C is one of the best ceiling speakers you can find on a budget and come highly recommended. The sound output from the Micca M-8C was surprisingly good and impressive. The sound from these speakers really packs a punch and delivers very crisp highs with a nice punchy low end. It has a typical V-shaped sound signature that focuses on the highs and low end frequencies; the M-8C ceiling speakers have a really nice low end response that sound great. They can also be connected to a home theater receiver and paired with the Micca M-8S ceiling speakers to create a full 5.1 or 7.1 surround sound listening experience. The sound projection that you get with the M-8C speakers is really good and achieves a nice soundstage with detailed musical separation. Listening to these speakers while playing orchestra music feels as though you are sitting in a real life concert hall with great instrumental separation. The speakers are loud and clear and give you a good sense of where each note is coming from. We also played some electronic dance music and pop music through these speakers and they sounded great, especially with a solid low end kick and punchy beats. For maximum impact, we would recommend adding a dedicated subwoofer to the entire system although the bass from the M-8C speakers alone is quite punchy with its 8” woofers. The Micca M-8C ceiling speakers have a no-frills and minimalist appearance that blend in easily into your home décor environment. They are really easy to install and be painted to match the color of you wall or ceiling. It comes with a 1” soft dome tweeter that provides focused imaging with a spacious soundstage; it is designed for a broadened listening spot and the tweeter employers a diffuser to provide an off-axis response and pivoting mechanism to achieve better sound projection. The 8” Mica-polypropylene cone is comes with butyl rubber surrounds for enhanced durability. The frequency response of the M-8C ceiling speaker is a wide 40 Hz to 20kHz with a sensitivity of 90dB and power handling of 100 watts each. It has an outer diameter of 10.75”, a cut-out diameter of 9.375” and a mounting depth of 3.6”. They mount flush into the ceiling and take up less floor and shelf space as compared to soundbars and floor standing speakers. If you are looking for high performance ceiling speakers on a budget, the Micca M-8Cs are definitely worth the investment. The Verdict? 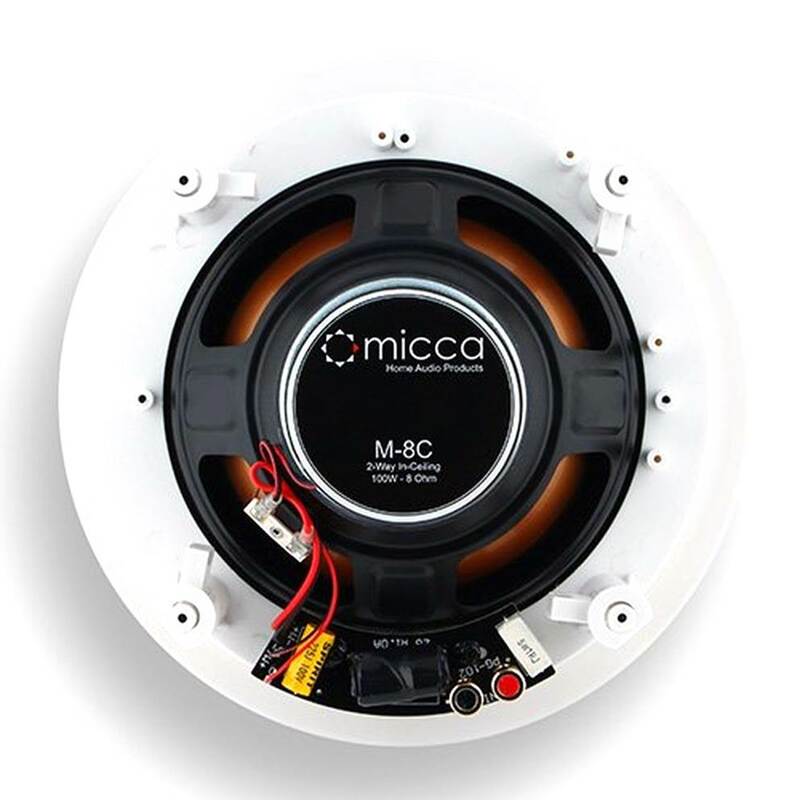 The Micca M-8C is hands down one of the best ceiling speakers you can find on a budget. They really deliver crisp and detailed sound performance, with enhanced bass response through their 8” woofers. If you are looking to set up a surround sound system without a dedicated subwoofer, the M-8C speakers will definitely pack a punch with their deep bass impact. Listening to electronic dance music and classic rock with these speakers was a surprisingly enjoyable experience, with great attention to detail, sweet highs and good bass that feels solid and impactful. They can also form part of a 5.1 or 7.1 home theater setup when paired with a home theater receiver. Installing the M-8C ceiling speakers was a breeze; you will need ceiling speaker wiring with these speakers but once they are fully mounted you can expect to get really good sound performance in your living room or office space. It also features a 6dB crossover between the tweeter and woofer for better sound coordination. Overall, the Micca M-8Cs is some of the best ceiling speakers you can find on a budget and we definitely highly recommend them. The Yamaha NS-IW280CWH is one of the best ceiling speakers you can find that delivers crystal clear sound performance. They come equipped with 6.5” polypropylene mica cone woofers and dual ¾” dome tweeters with Yamaha’s SoundMax technology for enhanced sound performance. It features a 100 watt maximum input capability and delivers very good full range sound that covers most of the audio spectrum. It also has a swivel tweeter for wide dispersion and produces much better soundstage than conventional ceiling speakers. They are very well constructed and have a durable design which can last for a long period of time; they can be used as presence speakers or surround sound side speakers in a home theater system setup. If you are looking for a cost-effective ceiling speaker to complement your home theater setup, the Yamahas are definitely one of the best ceiling speakers you can find at a very good price point. The sound performance of the Yamaha NS-IW280CWH is really good. When connected to a receiver, they can pump out tremendous amounts of volume while sounding clear and crisp; pairing 5 of these ceiling speakers together can easily transform your living room or basement into a disco club with rich and filling sound. The sound clarity that these speakers have is incredible; they will literally pick up every single detail in the music and will expose the flaws in poor quality audio recordings. They have a pretty bright sound signature with crisp highs and nice treble ranges; vocal performances and instrumental music sounded very clear with refined details and subtle notes sounding very clear through these speakers. The midrange performance is decent and you can pick up details in the music with relative ease. That being said, we found that the Yamaha ceiling speakers lack bass response and you might require a dedicated subwoofer to push up the bass response. When paired with a subwoofer, these speakers really shine and work very well to produce surround sound for movies or soundtracks. While these are clearly not the top of the line ceiling speakers, they really do produce sound quality on par with higher end ceiling speakers and are definitely worth checking out. The Yamaha NS-IW280CWH have a simple design and are relatively easy to install once you have run the ceiling wiring and speaker cable through the walls to the receiver. You can tell that these speakers are pretty well constructed straight out of the box and feature a really durable composite structure. They can be used as rear surrounds in your living room and you can also angle the tweeters to create a wider soundstage. 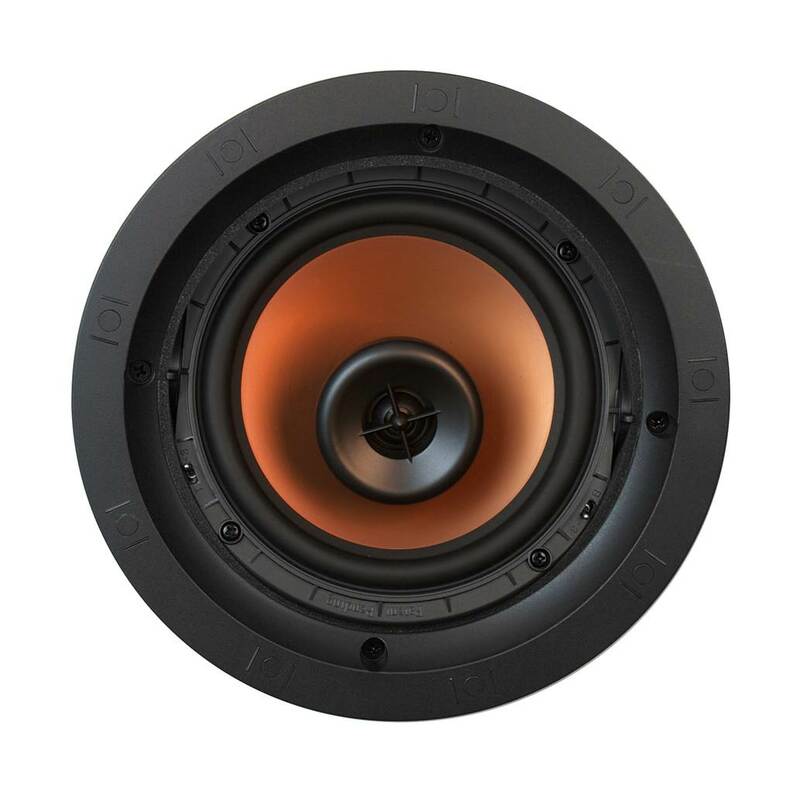 Each NS-IW280CWH speaker measures approximately 10” in diameter with a depth of 5”. The 6.5” woofer is titled at 12 degrees from the vertical axis and the tweeters swivels for directional sound aiming to project a sound image in your room. They also come with grilles which blend in easily into modern home décor and essentially disappear into the ceiling after installation. The ceiling speakers have a 100 watt maximum input capability so be sure to adjust the output settings on your home theater receiver accordingly. The Verdict? The Yamaha NS-IW280CWHs are some of the best ceiling speakers you can find that deliver really good sound clarity and performance. While they are not top of the line audiophile ceiling speakers, they certainly do pack a punch and can produce tremendous amounts of volume without any to very little distortion. You can use these speakers as passive surround speakers or rear speakers in a 5.1 or 7.1 home theater setup and connect them to your home theater receiver. They are very well constructed and made of quality components which will last a long time in your home. Each speaker comes with 6.5” polypropylene mica cone woofer and dual ¾” dome tweeters for crystal clear sound reproduction; the bass response from these speakers is not as strong as we expected and you might need a dedicated subwoofer to go with these speakers to get a full surround sound experience with low-end response. Installing these speakers is relatively easy and they blend into modern home décor reasonably well. If you are looking for one of the best ceiling speakers as a cost-effective option for your home or surround sound setup, the IW280CWHs are definitely the ones you should check out. The Silver Ticket 82C ceiling speakers are 2-way in ceiling speakers with an 8” mica polypropylene cone woofer and rubber edge that delivers crisp and powerful sound. They are one of the best ceiling speakers you can find in terms of versatility and are suitable for a wide variety of stereo applications to home theater setups for 5.1, 6.1 and 7.1 surround sound systems. It comes equipped with a 20mm silk dome tweeter which produces very smooth sound performance and a 15 degree swivel for sound projection. It has a really wide frequency response from 47 Hz to 20 kHz and a sensitivity of 89dB with an impedance of 8 ohms. It also features a crossover of 12dB per octave with a power handling of 60 watts nominal and 120 watts peak. The ceiling speaker has a solid construction and is moisture resistant which make it suitable for bathroom or outdoor patio installations. The sound quality that you get from the Silver Ticket 82C ceiling speakers is really crisp and clear. Overall, these are some of the best ceiling speakers you can find at a cost-effective price range and we highly recommend them. The sound performance of the 82C Silver Ticket speakers is excellent and comparable to higher end ceiling speakers in this category. They produce really crisp and detailed sound performance that feel really smooth and enjoyable to listen to. The highs are crisp and sweet while the midrange is present and detailed. The bass response that you get with these speakers is decent although they will definitely benefit from the additional of a dedicated subwoofer in the system for a deeper low end. Vocal performances were reproduced with a stunning level of detail and clarity. Instrumental music sounded organic and lifelike with these speakers – it really feels like you are sitting in a live concert hall while listening to these speakers. The 82Cs also provide really good soundstage and decent musical separation, so you really get a sense of where the sound is coming from with good accuracy. The sound quality that you get with the 82C speakers is really on par with higher end ceiling speakers that cost twice as much and they sound just as good. If you are looking to invest in a good sounding pair of ceiling speakers with really good sound quality and versatility, the Silver Ticket 82Cs are definitely the ones you should consider. 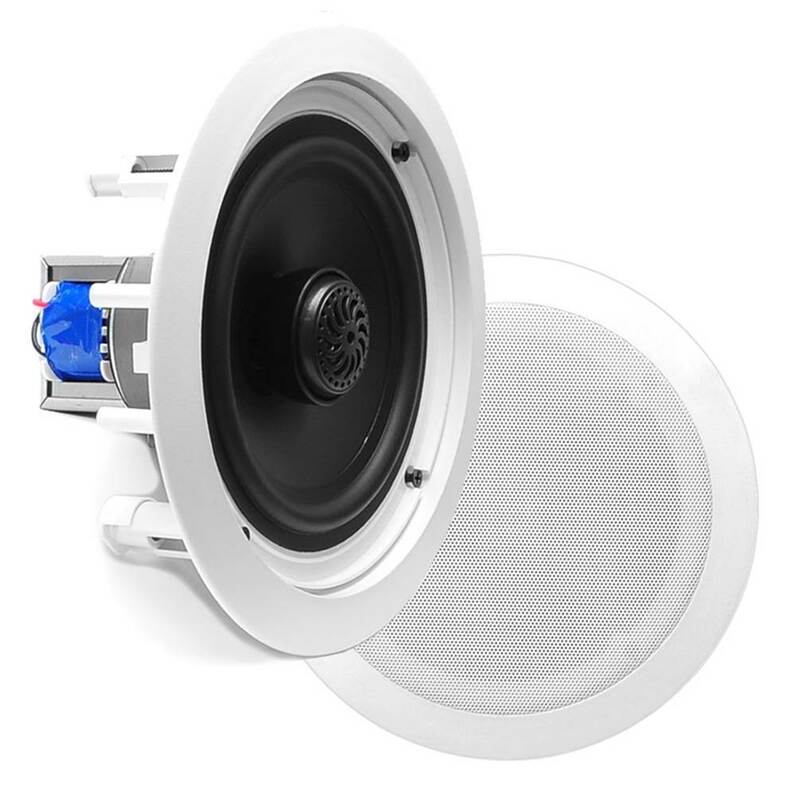 The Silver Ticket 82C ceiling speakers are relatively easy to install and mount flush in ceiling which makes them barely noticeable. They are highly versatile can be used for a variety of music applications such as restaurants, commercial offices, home theater or just for casual listening. The speakers are compatible with 5.1, 6.1 and 7.1 home theater systems and can be used as front left and right or rear surround speakers depending on your setup. 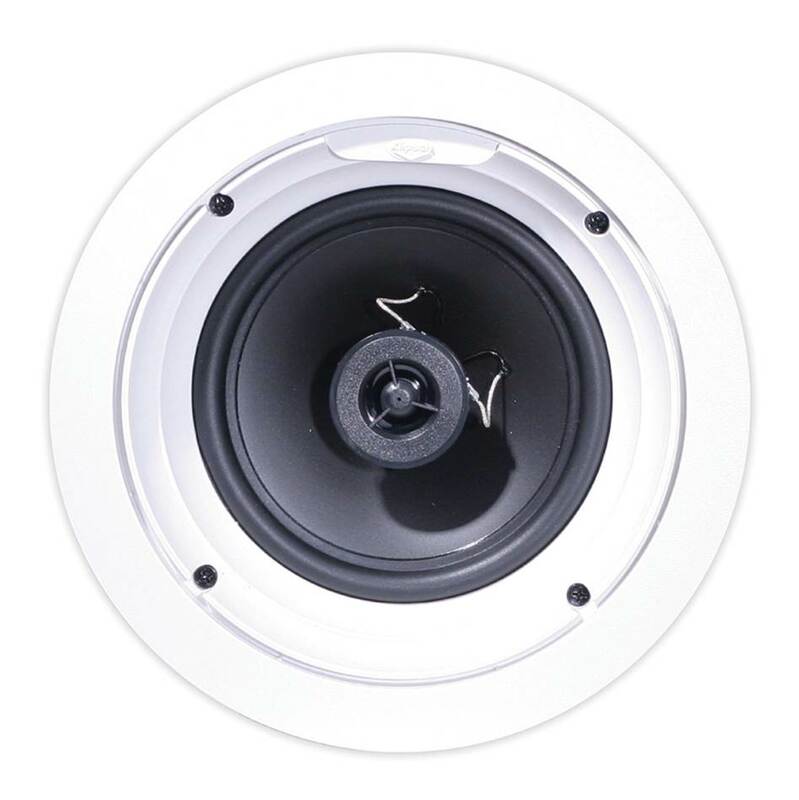 The 8” woofer cone is made from mica polypropylene to provide high quality sound performance; it also features rubber edges which enhances the overall durability of the ceiling speaker. The 20mm silk dome tweeter pivots for tuning of the soundstage – you get a really clear sound image from this ceiling speaker setup. It also comes with a high strength magnet that is tuned with the voice coil to provide clear distortion free sound at higher volume levels. We liked the fact that the ceiling speakers come with an accent trim around the edge of the speaker which provides a nice and clean appearance; it also comes with a flip-lever mounting system for easy and quick installation. The manufacturers also provide a wall hole cut out template and paint masks for installation. The Verdict? We were definitely impressed by the level of quality and sound performance that the Silver Ticket 82C ceiling speakers had to offer. They are some of the best ceiling speakers you can find that deliver exceptional value for money and really crisp sound performance. It’s a really versatile speaker that can be used for 5.1 and 7.1 home theater setups and deliver very good sound performance for casual listening or movies in a surround sound system. The 20mm silk dome tweeter pivots for you to adjust the sound imaging and create the perfect soundstage in your living room. It also comes with a 30oz magnet with the voice coil to deliver crisp sound performance at maximum volume without any harshness or distortion. It sounds and works just as well as higher end ceiling speakers and delivers very crisp highs, detailed midranges and decent bass response that feels enjoyable to listen to, although you might want to add a subwoofer for a more punchy low end. We also liked the fact that the 82C speakers came with flip-lever quick mount systems for easy and secure installation. Overall, the Silver Ticket 82C is one of the best ceiling speakers you can find at a very good price point and we highly recommend them. The Yamaha NSIC800WHs are some of the best ceiling speakers you can find with incredible sound quality and audio performance. The sound quality that you get with these speakers is top-notch and come highly recommended if you want a high-end setup with integrated ceiling speakers in a living room or bedroom. These are two way speakers with a maximum frequency response of 50 Hz to 28 kHz. They have an RMS output power of 140 watts and an impedance of 8 ohms, and feature a slim profile design for flush in-ceiling or in-wall. 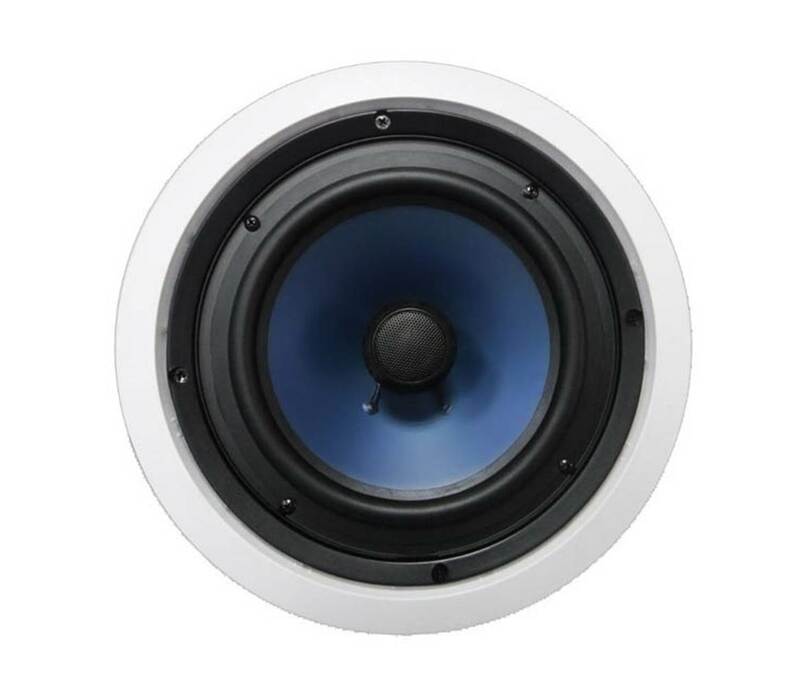 The IC800 ceiling speaker features a blue polypropylene mica cone woofer and soft dome swivel tweeter in a coaxial design to deliver enhanced sound quality and performance. The tweeter swivels and can be aimed to create a much wider soundstage in your home environment. It also features a grain-finished acoustic baffle with a spiral pattern for natural sound dispersion and a sealed back cover for extra durability. If you are in the market for some of the best ceiling speakers with extremely good sound performance, the Yamaha NSIC-800s are definitely worth checking out. When we connected the Yamaha NSIC-800 ceiling speakers to our home theater receiver, we were totally blown away by how realistic and good these speakers sounded. After a little tweaking with the EQ settings on the receiver and powering up the NSIC-800 ceiling speakers, they really pump out superb audio clarity and detailed sound performance that will make your ears yearn for more. Watching movies with these ceiling speakers felt as though we were sitting in a real life cinema, with realistic sound effects and detailed surround sound reproduction that spreads across the entire room. The musical separation that comes with the NSIC-800s is superb, and you can really pick up details in the music which you might never noticed were there. The soundstage from orchestra music and acoustic music was phenomenally good – they provide very good volume, clarity and dispersion across the audio spectrum. Vocal performances sounded very natural and uncolored with a nice sparkle at the treble ranges. The midrange is consistently present and very well defined; there’s quite a nice sonic impact at the midrange level which adds an extra punch to the music. The bass response is decent, although they would require a dedicated subwoofer to add a real low-end kick to the overall sound performance. The Yamaha NSIC-800 are very easy to mount and install securely on your ceiling. We particularly liked the fact they come with paintable grills and large mounting clamps which allows you to secure the ceiling speaker without additional mounting equipment. We particular liked the magnetic grill covers which make installation a breeze – just attach them to the speaker and you are done. The ceiling speaker is made of good quality components that make it feel really solid and durable. It comes with a ridge-shape aluminium cap with a stepped speaker surround which eliminates high-frequency peaks to deliver smooth sound at high volumes. It also features a sealed back cover which protects the driver unit from dust and moisture exposure. The slim grille becomes almost invisible after installation so it will be barely noticeable once installed. We also liked the fact that the fact that the tweeter swivels around so you can angle the sound projection in your room environment to get a much wider soundstage. The ceiling speaker has a diameter of 10-7/8” and a mounting depth of 4-1/4” and weighs 4.2 lbs. The Verdict? The Yamaha NSIC-800s are some of the best ceiling speakers you can find that deliver phenomenal sound performance. They are specially designed to pump out high volume outputs without distortion or any harshness, and have a maximum input power of 140 watts. The frequency response of these ceiling speakers is a good 50 Hz to 28 kHz and has a sensitivity of 90 dB. It comes with an 8” polypropylene mica cone woofer which delivers deep low end reproduction and a 1” soft dome swivel tweeter for crisp extended highs. Installing these speakers was a very simple process – it also comes with gold plated push-type speaker terminals to ceiling speaker wiring and comes with slim grilles with magnet catch that attaches to the ceiling speaker easily. You can tell that the manufacturers really put a lot of effort in ensuring that the NSIC-800s have the quality components it needs to deliver superb sound performance with a durable design. If you are in the market for high performance ceiling speakers, we are confident that the Yamaha NSIC-800s are one of the best ceiling speakers available on the market that is definitely worth the investment. The Klipsch R-1650-Cs are some of the best ceiling speakers you should consider if you are looking for an entry-audiophile set of speakers for your home installation. These speakers are specially created for those who are particular about sound performance and want high quality detailed sound in their home or surround sound setup. The R-1650-C features a 6.5” polymer cone woofer for deep bass reproduction and a large motor structure for higher musical sensitivity. 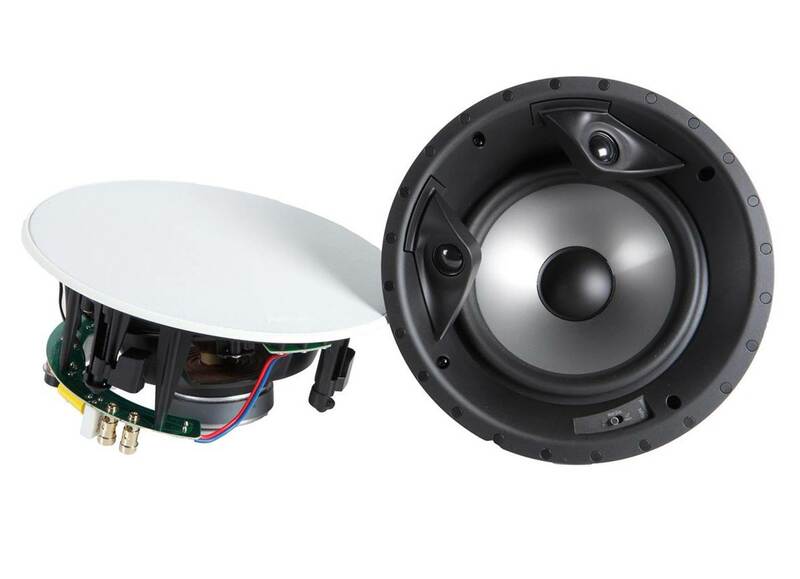 It also comes with a coaxially mounted 1” polymer dome tweeter which produces nice extended highs over a wider area. The ceiling speaker comes with a fully integrated mounting system which makes installation really easy; it also features paintable aluminium grilles with rust protection that allow it to blend in easily into your home ceiling. Overall, the Klipsch R-1650-Cs are some of the best ceiling speakers you can find at the entry audiophile level that delivers superb sound performance and we highly recommend them. The Klipsch R-1650-Cs delivers crystal clear sound and very detailed sound performance when paired with a decent stereo receiver or home theater receiver. They produce really good sound quality when used as rear speakers for a surround sound setup or as stereo speakers in the living room; you can listen to these speakers for hours on end without getting bored of the sound. The level of detail and sound reproduction that you get with these speakers is top-notch; you will be able to pick up the subtle details in the music easily with the R-1650-Cs and hear things which you might not have noticed before. They produce really good deep sound effects and fill the entire listening area with sound due to their omni-directional design. You can literally rediscover your soundtracks when listening to these speakers and hear them exactly as how they should sound through a quality speaker system. The highs and midrange are crystal clear and present, and the speakers produce pretty good full range sound that covers most of the audio spectrum. The bass response from the 6.5” cone woofer is surprisingly punchy and impactful – something that we did not expect from a set of ceiling speakers without a dedicated subwoofer. The Klipsch R-1650 are really simple and easy to install and blend into your home interior décor with its flush grilles. The ceiling speaker has an integrated mounting system which makes installation a breeze – the aluminium grilles that come with the speakers are paintable and provide rust protection from moisture. They are suitable for installation in kitchens and outdoor patio areas but should not be directly exposed to water and sunlight. You can tell that the R-1650-Cs are made of good quality components straight out of the box and they have a certain weight to them. It comes with a 6.5” polymer-cone woofer and a coaxially mounted 1” polymer dome tweeter which distributes sound over a wide area. The ceiling speaker has a dimension of 9.5” and a cut-out dimension of 8.3”. You can pair the Klipsch ceiling speakers with other floor or shelf speakers to achieve a full 5.1 or 7.1 setup when connected to a home theater receiver. The Verdict? The Klipsch R-1650-Cs are some of the best ceiling speakers you can find that deliver exceptional value for money. These speakers are designed to produce very good entry-level audiophile sound quality that works well in a home theater setting or in a surround sound setup. The speaker produces very crisp highs, detailed midrange and decent bass response; they have a very wide area of dispersion and we would recommend separating each speaker pair by at least 8 feet. Watching movies with the R-1650-Cs was a really enjoyable experience, with detailed sound effects and smooth dialogue. You can really feel and hear the sound from the R-1650-Cs; the bass response is surprisingly good and impactful. Vocal performances sounded very crisp with plenty of soundstage and musical separation, while instrumental music sounded clean and crisp throughout. It produces pretty good full range sound quality that covers a wide frequency area. If you are looking for one of the best ceiling speakers with entry-audiophile level sound quality, the Klipsch R-1650-Cs are definitely the speakers you should get. 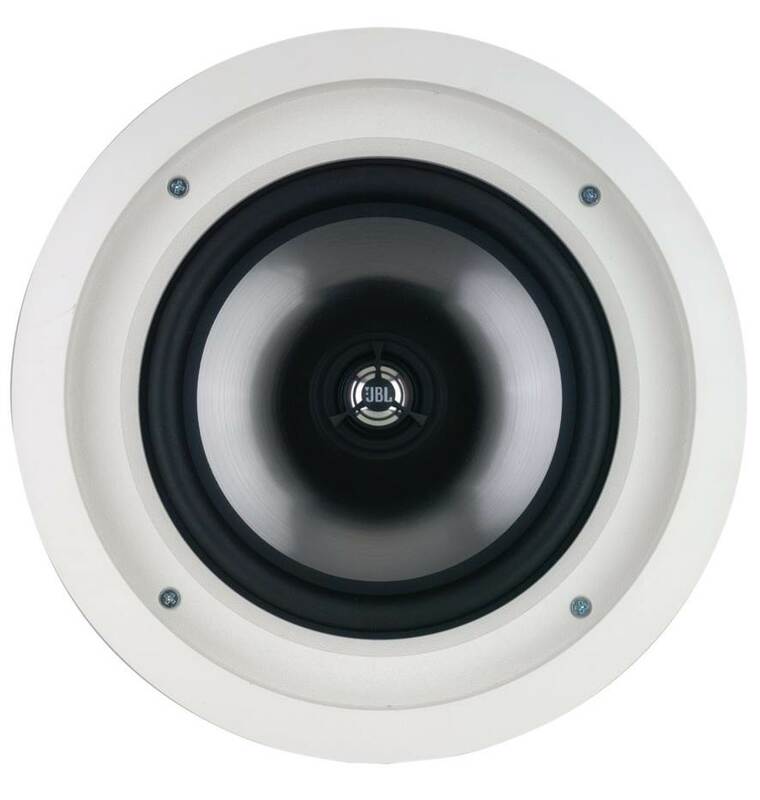 The Pyle PDIC51RDBKs are a pair of good quality ceiling speakers you can find in a compact setup. They are some of the best ceiling speakers that are easy to install and have a dimension of just 8” and a cut out dimension of 6.5” with a depth of 2.625”. It is a 2-way stereo sound speaker with a 1” high temperature voice coil, and a directable 1” poly dome tweeter for crisp sound reproduction. It has a nice frequency range of 80 Hz to 20 kHz and has a 150 watts rated peak power. They mount flush on walls or ceilings and work well for custom installations and home theater applications. It’s a really compact ceiling speaker that mounts easily into the ceiling and works pretty well straight out of the box when connected to a decent stereo receiver. It can also be used as rear speakers or surround sound speakers in a 5.1 or 7.1 home theater setup if required. Overall, they are some of the best ceiling speakers you can find with a compact design and provide really good sound quality for the price. The Pyle PDIC51RDBKs work well for casual listening or for office commercial applications. While they are not the kind of speakers you would want to install for high-end home theater applications, they work perfectly if you just want a quality ceiling speaker that can pump out decent volume and sound performance for casual listening. When connected to our stereo receiver, the Pyle ceiling speakers produce very nice sound quality that feels crisp and well defined. Instrumental music can be heard clearly from these speakers, with a certain degree of musical separation that allows you to listen to where the sound is coming from. They create a nice stereo image when used together as a pair with approximately 8” distance between each speaker. The amiable tweeter works well for you to create a rather good soundstage with these speakers and direct the sound to a sweet spot. The speakers can pump out decent volume when connected to an audio receiver. That being said, they start to distort at high and maximum volume levels which is expected from a budget set of ceiling speakers. Apart from this, they produce really good quality sound and reasonable volume levels for causal music listening; you might want to add a subwoofer to go with these speakers for a deeper low-end response. The Pyle ceiling speakers have a sleek and minimalist compact design that occupies less space when installed in ceiling. Straight out of the box, you can feel that the Pyle ceiling speakers have a nice quality construction with durable components. They install easily and mounts flush into the ceiling which blends into your home décor environment. They are equipped with a 1” high temperature voice coil and a direct 1” polymer dome tweeter which delivers a full rich sound. They can pump out up to 150 watts of volume and come as a pair which makes them ideal for home stereo applications. They have a good frequency range between 80 Hz to 20 kHz and produce nice sound quality, although we would not recommend them for higher end setups or home theater systems. They also work great for custom installations in the office or for commercial shops or just for casual home listening. The Verdict? The Pyle PDIC51RDBKs are among the best ceiling speakers you can buy on a budget with an incredibly compact design. They are very easy to install and produce pretty good sound quality for their size – they have a maximum power rating of 150 watts and a wide frequency response for full range sound. The volume that these speakers can produce is really good although they might start to distort at close to maximum volume. They are great if you are just looking for a set of ceiling speakers to install in your home or for casual listening. Installing these speakers is relatively straightforward although you will need run the speaker wiring through your ceiling to the receiver to get these powered up. If you are looking for a very cost-effective set of best ceiling speakers or are looking for a beginner setup for home audio, we would definitely recommend the Pyle PDIC51RDBKs as a great starter choice. The Theater Solutions TS80C are some of the best ceiling speakers you can find to include in your in ceiling surround sound system or home theater setup. They are capable of producing high definition surround sound and come with 8” extended throw black woven Kevlar cone and an 8 ohm driver rated at 250 watts RMS and 500 watts max per pair. The ceiling speakers are capable of delivering full range sound with an excellent frequency range of 30 Hz to 20 kHz with a 92 dB efficiency. Each speaker is equipped with silk/titanium dome tweeters with 15 degree swivel mount. It also comes with cut-out templates and full installation instructions included for easy reference. Overall, the Theater Solutions TS80C are some of the best ceiling speakers you can find that deliver stunning sound performance with powerful bass in a compact package, and deliver exceptional value for money. The TS80C ceiling speakers work great as part of a surround speaker setup or a standalone stereo ceiling pair and produce distinctly clear vocals and midrange performance. The highs are crisp and clear, and they really shine when connected to a decent home theater amplifier. The sound performance that we experienced with the TS80Cs was really natural, smooth and impactful. They reproduce sound with a certain quality that makes it feel really pristine and accurate – vocal performances sounded really sharp and clear, while orchestra performances had plenty of soundstage with good instrumental separation. The acoustic drivers on the TS80C speakers are really capable of distinguishing between the subtle notes in the music – you can pick up details in the music which you might have never heard before. When paired with a dedicated subwoofer, the TS80C in ceiling surround sound speakers will really rock your entire apartment or living room with rich and filling sound. If you are into the full home theater experience, the TS80C in ceiling speakers will definitely impress you with good bass and full bodied sound. You can tell that the Theater Solutions TS80Cs are made of high quality materials straight out of the box – they have a certain weight to them which indicates that they are made of quality components. The ceiling speakers are made from moisture resistant materials and are computer designed to achieve a balance between sound quality and design quality. We liked the fact that these in ceiling surround sound speakers come equipped with silk/titanium dome tweeters with a 15 degree swivel mount so you can easily adjust the sound projection to get better sonic imaging. It also comes with cut-out templates and full installation instructions for easy setup – each ceiling cut-out size is 9.625 inches. Installing these speakers is simple and straightforward and is just like installing any other ceiling speaker – you can connect them to your surround speaker setup and dedicated subwoofer to achieve in ceiling surround sound with a home theater receiver. The Verdict? The Theater Solutions TS80Cs are some of the best ceiling speakers you can find that are built to deliver high-definition sound performance. They produce really good full range sound with a wide frequency range of 30 Hz to 20 kHz and deliver very crisp and detailed sound. Listening to the TS80Cs in your living room feels like sitting in a real life cinema with deep sound effects and punchy beats that penetrate through the entire room. These speakers do produce decent bass performance but will require a dedicated subwoofer to enhance the low end response of the overall system. The 8” cone and 8 ohm drivers produce crystal clear sound that does not distort at maximum volume – you can really crank up the volume on these speakers and still expect to get clear sound performance. We liked the fact that these speakers are equipped with a 15 degree swivel mount which allows you to project the sound at an angle to achieve a much better soundstage depending on your room environment. Overall, the TS80Cs are among the best ceiling speakers you can find at a cost effective price range and we highly recommend them. The Definitive Technology UEWA/Di 8R is one of the best ceiling speakers you can find that delivers great audio performance for integration with high-end home theater systems. These speakers are capable of delivering thunderous sound performance with high volume levels and deep sound effects; you will feel as though you are listening to cinema speakers with these the Definitive Technology ceiling speakers. It’s the perfect speaker to use as rear surround speakers or side speakers in a home theater setup. They blend in really well into modern home décor due to their small diameter and hidden flange design with low profile micro-perf grilles. They are also really easy to install as traditional flush mount speakers and do not require advanced mounting equipment. The DI 8R grille has a dimension of 9-3/4” inches and is barely noticeable when installed. They also come with pivoting pure aluminium dome tweeters for extended crisp highs. If you are looking for one of the best ceiling speakers to install with your home theater setup, the DI 8R ceiling speakers come highly recommended. We were pretty much blown away by the sound performance of the Definitive Technology Di 8R ceiling speakers. When we connected these ceiling speakers to the home theater receiver, the sound quality that we got was phenomenally good and it really produces room filling sound that sounds cinema-like. The ceiling speakers have a really wide sound coverage and we would recommend setting these speakers at least 10 feet apart due to the wide spacious sound. They work really well as front and center speakers for surround sound setups or as rear speakers with floor standing speakers acting as the front left and right channel speakers. The highs and midrange was crisp, clear and extremely well defined. It has a decent bass punch and can reproduce low-end sound performance pretty well even without a dedicated subwoofer. Watching movies with the DI 8R speakers was an incredible cinematic experience, with deep surround sound effects and excellent spatial imaging and musical separation – you can really tell where the details originate from and the sound definitely has an added presence with these speakers. They are ceiling speakers that really deliver solid sound performance with solid amplification. The Definitive Technology DI 8R speakers are relatively easy to install and blend in really well with modern home décor. It come with a nice flangeless design and micro-perf grille which minimizes visibility – they really do disappear into the ceiling after installing them. You can also use these speakers in a full 5.1 or 7.1 system as front and center speakers. We liked the fact that the DI 8Rs come with pivoting aluminium dome tweeters which you can use to create a soundstage in your living room or home theater environment. The DI 8R grille has a diameter of just 9-3/4” which makes it relatively small and easy to install. We also liked the fact that the grilles are magnetically held, which means that you don’t need screw-drivers or other equipment to mount the ceiling speaker grilles. Do note that if you want a full surround sound experience with deep bass impact, you should consider installing a dedicated subwoofer to go with these speakers for an extra low end punch. The Verdict? We were thoroughly impressed by how good the Definitive Technology DI 8R speakers sounded – they are definitely the speakers you want to have in a high end home theater setup. The sound performance that you get with these speakers is top notch, with distinct crystal clear highs, clear vocal reproduction and very smooth dialogue. The midrange is present and clear, and the bass response hits hard with a solid impact. Listening to these speakers while watching movies feels as though you are sitting in a real life cinema; you can also crank up the volume on these speakers without any distortion which is great. The speakers install easily into the ceiling and are barely noticeable once installed – they blend in really well with the micro-perf grille design which attach magnetically to the speaker. The pivoting tweeters also provide some room for adjustment to get the desired soundstage with these speakers. The DI 8R speakers have a wide sound coverage and will fill up medium to large rooms with rich and filling sound without any issues. If you are looking for one of the best ceiling speakers to include in your home theater setup, the Definitive Technology DI 8R speakers might be your best bet. 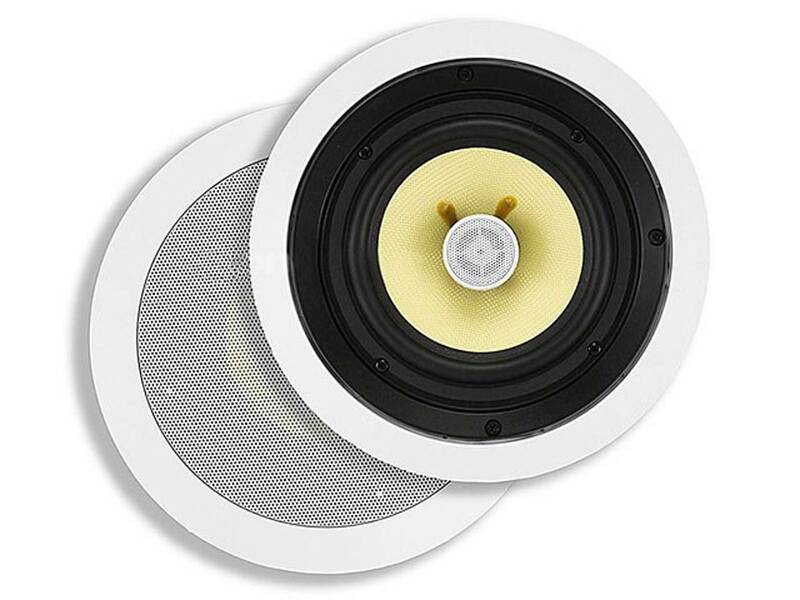 The Monoprice Caliber 6.5” ceiling speaker is one of the best ceiling speakers you can find with an excellent combination of performance and design. It features Kevlar fiber cone drivers that deliver cleaner bass reproduction, and comes equipped with a lightweight transducer to produce natural sound with significantly less distortion at higher volumes. The advantage of using aramid fibers for the woofer means that it can hit harder and handle more power than conventional drivers. It also has a titanium silk dome tweeter that produces clean, crisp and crystal clear highs with defined vocals. The Caliber ceiling speakers can be used as the front left or right speakers in a home theater setup or as passive rear surrounds for immersive sound effects. The Caliber ceiling speakers are also sonically matched to provide a uniform soundstage across the entire listening area, and are compatible with 7.2.4 Atmos and DTX-S immersive cinema systems. Overall, the Monoprice Caliber are some of the best ceiling speakers you can find that deliver an excellent balance of sound and performance, and we highly recommend them. The sound quality from the Monoprice Caliber speakers is exceptionally clear and detailed. They sound great straight out of the box and when connected to our home theater receiver. It produces reasonably good full range sound with a wide frequency response between 55 Hz to 20 kHz with an impedance of 8 ohms. The highs and midrange felt clean and detailed, while the treble ranges felt as though they had an added layer of sparkle. The midrange frequencies were produced very smoothly; vocal performances came across as natural and smooth. Listening to instrumental music with these ceiling speakers allows you to pick up subtle notes in the music with good directional sonic imaging – you can tell where the piano or harp is coming from while listening to music. Watching movies with the Monoprice Caliber was a really fun experience with great sound effects and detailed dialogue. The 6.5” cone woofer does produce decent bass impact but the bass is nothing to shout home about. We would recommend adding a dedicated subwoofer to the system for extra bass response. In terms of design, the Monoprice Caliber really gets a lot of things right. It comes with a built-in high frequency attenuator for you to fine tune the music brightness to suit your room environment. It comes with a metal grille which can be painted to match your ceiling color and can be easily installed with simple hand tools. The Caliber ceiling speakers have a power handling capacity of 60 watts nominal and 120 watts maximum; it is equipped with a 6.5” Kevlar woven cone woofer with a 16.5oz magnet and rubber surrounds for added durability. The ¾” titanium dome tweeter can swivel a nice 20 degrees which allows you to adjust the sound projection to some extent. The speaker has a sensitivity of 89dB and a crossover of 12dB per octave. The cut out dimensions of the speaker is 8.07” and has an overall dimension of 9.4” with a mounting depth of 2.8”. Installing these speakers was a breeze provided that you have hooked up the ceiling wiring to the receiver. The entire package comes with two 6.5” 2-way in ceiling speakers with grille, installation instruction, cut-out templates and grill removal tools for easy reference. The Verdict? The Monoprice Caliber is one of the best ceiling speakers you can find that delivers dynamically well balanced sound quality. It has a nice frequency response of 55 Hz to 20 kHz and produces crisp highs, balanced midrange and decent bass response with its 6.5” cone woofer. The entire speaker is constructed very well and features high quality components including a ¾” titanium silk dome tweeter and 35mm voice coil. It also has a crossover with 12dB per octave. They are capable of producing tremendous amounts of volume without distorting and really bring life to your movies and music. The sound quality that you get from these ceiling speakers is clear, sharp, well defined and crisp. Vocal performances and dialogue sounded smooth without any harshness, and the speaker covers quite a good range in the room and spreads out the sound very well. Installing these speakers was a breeze and it comes with almost all the things you need to get started with the wiring to the receiver. If you are looking for one of the best ceiling speakers with dynamic sound performance and a solid construction, the Monoprice Caliber is definitely the one to get. The Speakercraft Aim 7 is a phenomenal sounding ceiling speaker that produces one of the best music quality we have heard in a long time. It is the best ceiling speaker to get if you are looking for a speaker that can reproduce natural, organic sound with depth and clarity. Each Aim 7 ceiling speaker can be entirely pivoted towards the listening while remaining discrete behind flush mount grilles. It comes with a pivoting and rotating 7” resin reinforced fiberglass cone woofer that produces very good stunning low end bass, and a 1” silk dome tweeter for crisp highs. The AIM 7 speakers are all timbre-matched to all two series speakers. We liked the fact that the AIM 7 comes with fully pivoting woofers and pivoting tweeters which allows the entire speaker to be aimed in a particular direction and to set the soundstage in your living room. 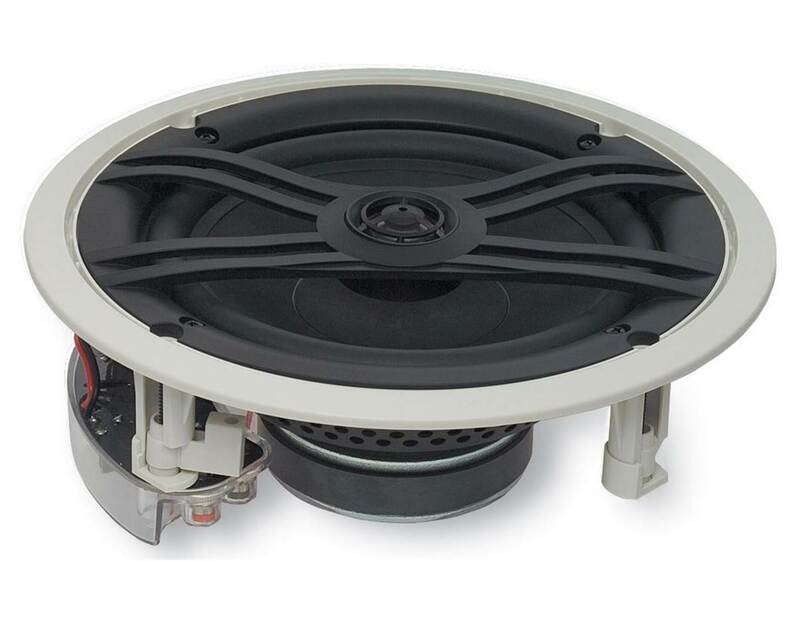 The speaker has a power handling rating of 5 to 125 watts with a diameter of 9-7/8” and 5-1/8”. If you are looking for one of the best ceiling speakers that produce incredible sound quality, the Speakercraft Aim 7 is definitely the way to go. The sound performance of the Speakercraft Aim 7 easily surpassed all our expectations. They produce such well-defined, crisp and detailed sound performance that will redefine what you can expect from a pair of in-ceiling speakers. The bass response that you get with the Aim 7 is incredibly tight and punchy, and feels as though you are standing in front of a mini subwoofer. You can really crank up the volume on these speakers when connected to the dedicated receiver and not expect to hear any distortion at all. The connections were smooth and pristine without any hint of static through the acoustic drivers. Watching movies with the Aim 7 speakers was an exhilarating experience with extremely detailed sound effects and musical separation – it almost feels as though you are sitting in a real life cinema while watching movies on your TV screen. The level of detail and power that these speakers pump out is on another level – the midrange is nearly perfect and present in all the audio recordings. Vocal performances sounded natural and organic with crisp treble ranges that adds a layer of sparkle to the music. If you are looking for a ceiling speaker that will blow you away with incredible sound performance, the Speakercraft Aim 7 is definitely worth checking out. The Speakercraft Aim 7 has a very sleek and unique design that blends in well into modern home décor. They are really good speakers to include in high end 5.1 or 7.1 home theater systems due to their volume projection and superb sound quality. Each Aim 7 speaker can be entirely pivoted towards a sweet spot while remaining covered by a flush mounted grille. You can also easily change the direction of the speaker orientation with the push of the hand. The Speakercraft Aim 7 is made of good quality components and the solid material constructions shows throughout the speaker’s design. It’s a really durable speaker that you can mount on your ceiling for a long period of time without having to worry about wear and tear. The speaker will need to be connected to a decent home theater receiver with at least 80 to 100 RMS per channel for optimal sound performance. Installation of the speaker is a breeze and comes with almost everything you need to get started straight out of the box. The diameter of the Aim 7 is 9-7/8” and has a depth of 5-1/8”. The Verdict? The Speakercraft Aim 7 is one of the best ceiling speakers you can find that delivers absolutely stunning sound quality. The sound from these speakers is top-notch with crisp highs, very detailed midrange and good bass response that actually hits hard. The 1” silk dome tweeter produces extended highs with nice sparkle, and the 7” woofer produces good low-end frequencies that enhance the overall sound performance. The Aim 7 can focus sound onto a particular direction but has quite a large area of projection so you can set the speakers 10 feet apart for a much wider soundstage. They work great as front speakers in a 5.1 setup or rear speakers at the back where they can deliver deep acoustic sound effects. Installing these speakers was a breeze and took only a couple of minutes with their easily mountable design. It also mounts flush in ceiling so that they become barely noticeable once installed and really clean from the outside. If you are an audiophile looking for great sound quality with in ceiling speakers, the Speakercraft Aim 7 is definitely the ones to get. The Polk Audio 80 F/X RTs are some of the best ceiling speakers you can find in the high-end range that deliver superb sound quality. These ceiling speakers are part of Polk’s Vanishing Series RT speakers that are timbre-matched to Polk RTI speakers to provide consistency in tonal quality and sound performance. 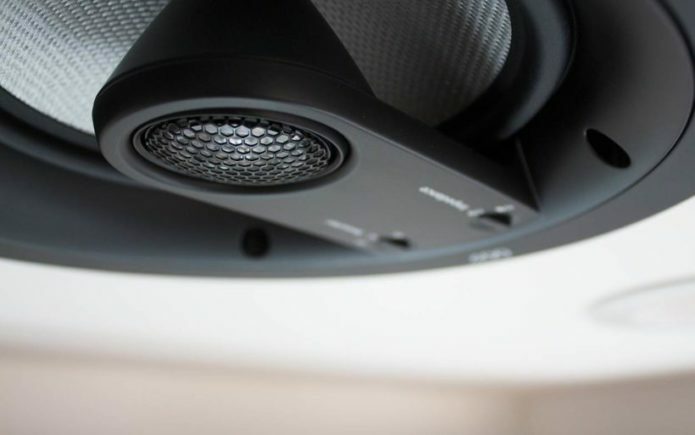 The 80 F/X RT speakers features wafer-thin sheer grilles and a magnetically secured grille that protrudes only 7mm which makes it barely noticeable when installed on the ceiling. The speaker itself also comes with dual bandpass bass ports in highly efficient small enclosures which funnels the woofer low end frequencies down the driver array for much deeper bass response. 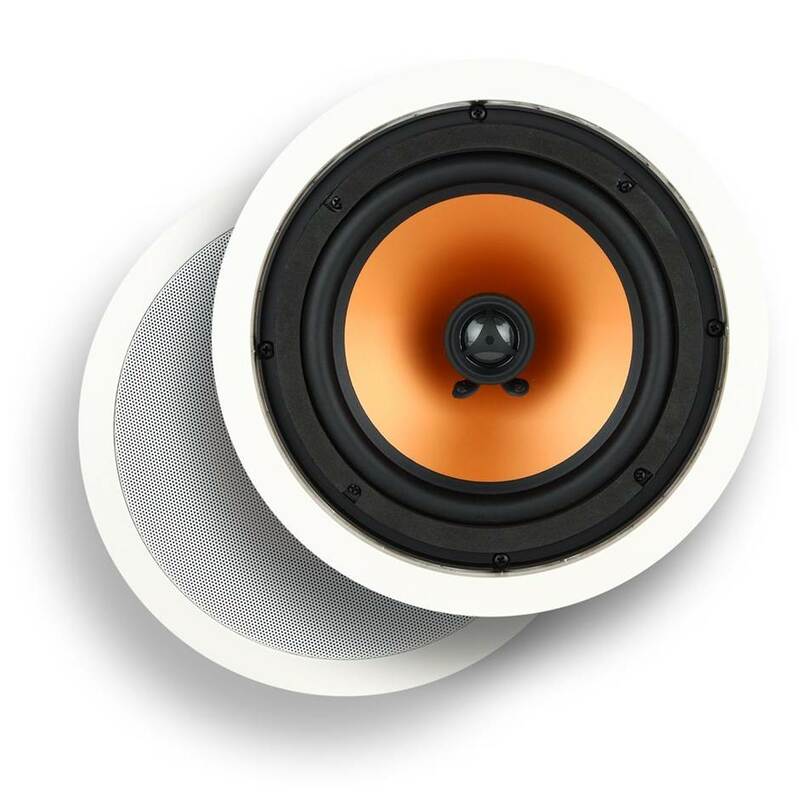 The end result is that you get a good blend of crisp highs with punchy bass from the 80 F/X RT ceiling speakers. It also features an easy one-cut drop in installation with fit templates and a precision flange which helps secure the speaker in place once installed. If you are looking for a no-frills high end ceiling speaker, the Polk Audio 80 F/X RT ceiling speakers are definitely the ones you should check out. The sound quality of the Polk Audio 80 F/X RT is powerful, rich and impactful. They are really good speakers to get if you are into high-end audio music or for surround sound. They produce very distinctive sound with crisp highs, warm and detailed midrange with solid bass impact – even without a subwoofer, the bass hits hard and feels punchy. You can easily use these speakers as surround sound speakers or front speakers in a 5.1 or 7.1 speaker system. They are really good speakers to have if you need to fill a medium size to large room with sound. When we connected the 80 F/X RT speakers to our home theater receiver, we were blown away by the level of detail and smooth sound reproduction that these speakers gave. The extended highs were crisp and clear, with very good vocal reproduction and smooth dialogue that permeates throughout the movies. The sound effects feel balanced without overwhelming the midrange. The speakers produce nice soundstage and musical separation so you really get a sense of where the details are coming from. Overall, they are some of the best high end ceiling speakers you can find that deliver impressive sound quality. The Polk Audio 80 F/X RT has a really sleek and modern looking design that feels very premium straight out of the box. They mount flush into the ceiling and are barely noticeable once you attach the grilles to the speaker. The speaker grille is wafer thin and secures magnetically onto the speaker for easy installation. We liked the fact that Polk speakers come with easy one-cut, drop in installation with templates and a precision flange to make the installation process as simple as possible. Do note that you will have to run the speaker wire cabling through your ceiling before you can get these speakers set up. We would also recommend connecting these speakers to a home theater receiver or stereo receiver with at least 100 RMS per channel to produce enough power to push them. The speakers are made from very high quality components that have a certain weight to them; the 80 F/X RT speakers look pretty durable with a solid construction base. The Verdict? The Polk Audio 80 F/X RTs are some of the best ceiling speakers you can find that really delivers superb sound quality and performance. They are high end speakers that you should consider if you are looking to add ceiling speakers to a full 5.1 or 7.1 setup. They also work well as stereo pair speakers for your home TV or audio receiver. The sound performance from these speakers is superb with crystal clear highs, detailed midrange and deep bass response. Vocal performances and instrumental music were reproduced with plenty of soundstage and accuracy. Listening to these ceiling speakers really makes you feel as though you are sitting in a real life concert hall with plenty of spatial imaging and detailed vocals. Watching movies with these speakers was a really enjoyable experience with full surround sound and enough power to rattle your entire living room. While these speakers will definitely benefit from the addition of a powered subwoofer, they do produce enough bass on their own although you might need to tweak the EQ settings on your home theater receiver. On the whole, the Polk Audio 80 F/X RTs are some of the best ceiling speakers you can get in the high end range so don’t forget to check them out! The Pyle Home PIC8E 8” two-way ceiling speakers are some of the best ceiling speakers available in the mid-tier range that deliver exceptional value for money. They are specially designed to deliver high performance audio in your home or for official office use. It comes with an 8” polypropylene cone for full range mid-bass sound reproduction, and a pivoting 1” voice coil silk dome tweeter for crisp extended highs. The ceiling speaker has a sensitivity of 88 dB and an impedance of 4 to 8 ohms, with a power rating of 150 watts RMS and 300 Watts peak power. The speaker is capable of delivering reasonably good full-range sound with a frequency response of 35Hz to 20kHz. It also comes with built-in mounting hardware for easy installation and has a cut out dimension of 4.13” x 11.02”. The ceiling speaker also features adjustable built-in treble controls for you to adjust the sound quality according to your room environment. Overall, the Pyle Home PIC8Es are some of the best ceiling speakers you can find that delivers very good sound quality at the mid-tier level and are definitely worth checking out. The sound quality of the Pyle PIC8Es is pretty much well balanced and delivers crisp highs with surprisingly good midrange frequencies. The highs are crystal clear and sound pretty sharp without any harshness, while the midrange and mid-bass has a certain solid quality that feels very nice to listen to. They have a really consistent sound quality from the lows through to the midrange and into the highs. They work really well with 5.1 or 7.1 speaker systems and have nice depth to the sound quality. The bass response was surprisingly good and it hits hard, providing an extra layer of kick to the music. While the sound performance from these speakers is not the best that we have heard, they really surprised us at how good the sound quality from these speakers was considering their price point. Instrumental music and vocal performances sounded really good through these speakers with plenty of midrange and detailed highs with a layer of sparkle – while they are a little light on the highs, they have plenty of midrange which more than makes up for it. Overall, the Pyle PIC8Es are really decent sounding speakers that deliver quality sound performance and integrated well in a surround sound setup. The Pyle PICE8 speakers have a clean and minimalist design that blends in into your ceiling or wall décor. It features a nice rubber cone surround for extra durability and a pivoting 1” soft dome tweeter which you can use to adjust the sound projection. Do note that the tweeter feels slightly flimsy can be easily snapped off so be sure to be careful while adjusting it. The Pyle ceiling speakers also come with an adjustable treble although this may not be necessary if you can adjust the EQ settings directly from your receiver. The crossover on this speaker is decent and you can easily crank up the volume on the PICE8 speakers without hearing any distortion. Installing these speakers is a simple process but do note that they come with plastic push-type connectors which may be too small for 14 or 12 gauge wire to fit in. The entire setup includes built-in mounting hardware for easy installation; it has a frequency response of 35Hz to 20kHz with a power rating of 150 watts RMS. The cut out dimensions of this ceiling speaker are approximately 4.13” x 11.02”. The Verdict? The Pyle PICE8s are the go to ceiling speakers in the mid-tier range if you want good quality at a value price point. They are some of the best ceiling speakers we have tested that deliver incredible value for money. When connected to our home theater receiver, these speakers deliver crisp highs, very good midrange and mid-bass response that permeates through the entire music. The highs feel a little light although the speaker does put more emphasis on the midrange frequencies. Vocal performances and instrumental music sounded refined with a certain mid-bass presence that gives it a solid quality. Rock and pop music sounded decent through these speakers although they will definitely benefit from adding a dedicated subwoofer into the system for a much deeper low-end. The ceiling speaker features a pivoting 1” voice coil silk dome tweeter and 8” polypropylene cone woofer for enhanced sound performance. While it’s not the best ceiling speakers you can find, the Polk PICE8s certainly do pack a punch and represent a good value investment. 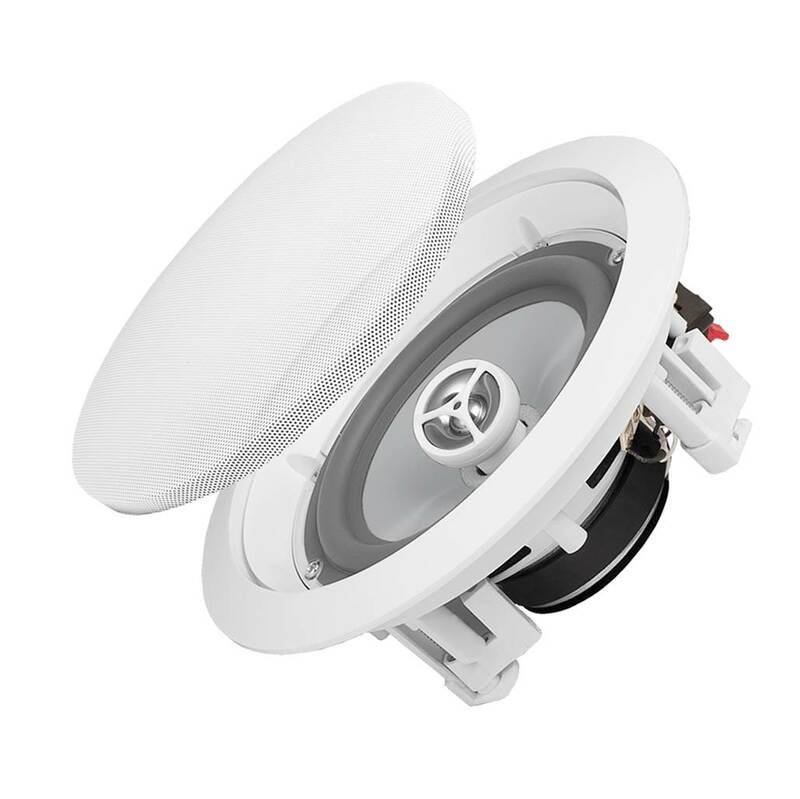 If you are looking for one of the best ceiling speakers for humid areas such as outdoor patios or bathrooms, the OSD Weatherproof 8” ceiling speakers might be your best bet. The ceiling speaker is constructed from solid materials and durable components to withstand high or low temperatures without hardening or cracking – it has a low profile design which makes it less intrusive in rooms with low ceilings. The entire speaker is built like a tank and will survive moist and damp areas without any issues although it should not be directly exposed to water. The ceiling speaker comes equipped with an 8” polypropylene cone woofer, 1” polycarbonate dome tweeter for extended highs with a sensitivity of 90dB. It has a pretty wide frequency response from 38 Hz to 20kHz to deliver full range sound performance. 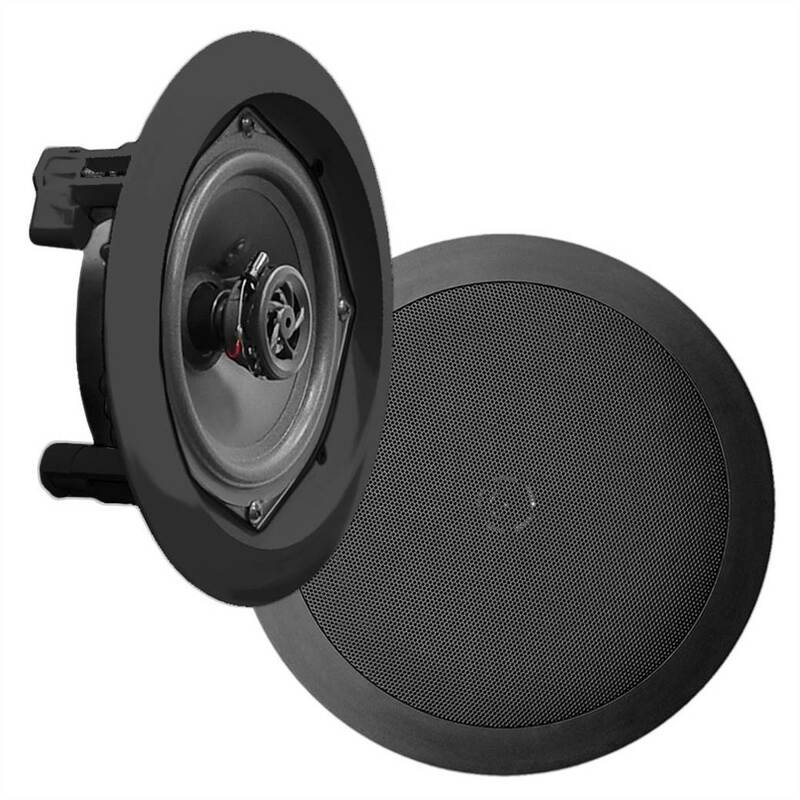 If you are looking for one of the best ceiling speakers with a fully weatherproof resistant design, the OSD Weatherproof 8” ceiling speakers are definitely the ones to get. The sound quality of the OSD ceiling speakers was really good and surpassed our expectations of what a weatherproof speaker can sound like. The 1” polycarbonate dome tweeter produces very sweet highs that felt smooth to listen to, and greatly enhanced the crispness of vocal performances. 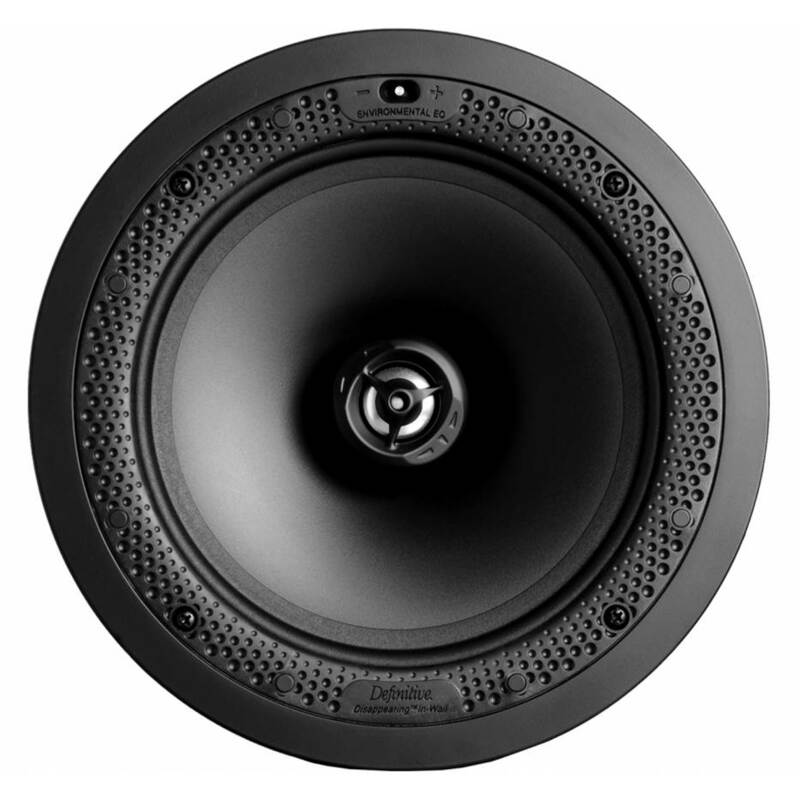 The 8” polypropylene cone woofer does produce a decent low end but is more geared towards mid-bass responses. The end result is that you get sound that feels solid and impactful. When we connected these speakers to our stereo receiver, we got a really smooth sound quality with nice beats with electronic dance music and rock and pop music genres. The details in the music are reproduced with great clarity and you can crank up the volume on the OSD speakers without getting any distortion. They work better as standalone speakers in the bathroom or patio rather than in an integrated surround sound setup. The bass response that you get with these speakers is truly a mark above the rest and hits hard; it has a really good low-end quality and mid-bass response that feels really pleasant to listen to. 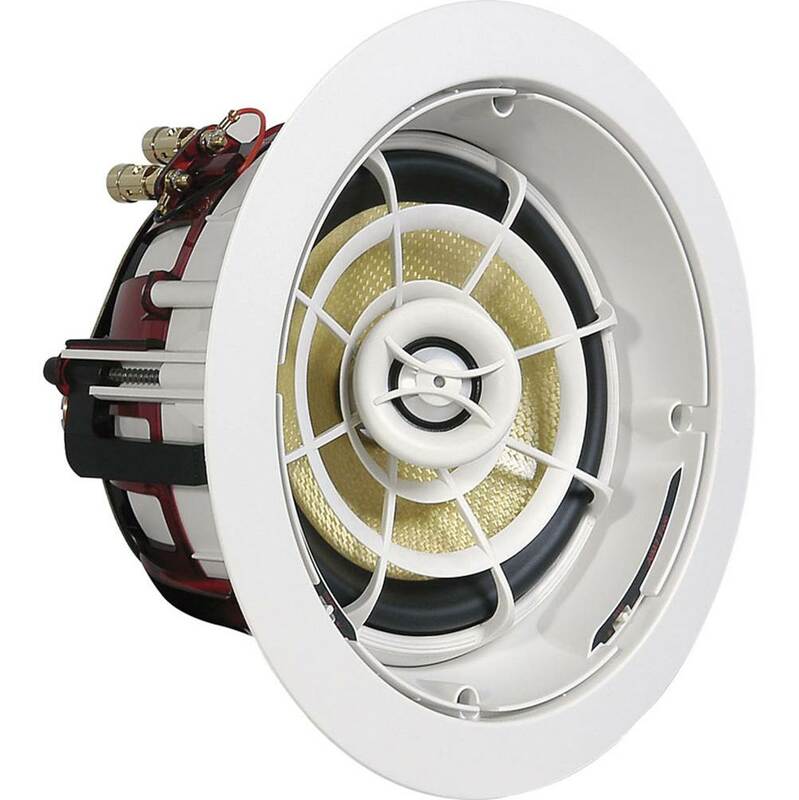 The structural construction of the OSD ceiling speakers is really solid and good. You can tell that it is made of quality components straight out of the box and the components do have certain weight to them. They are really straightforward and easy to install and you can hook them up in a matter of minutes. It has a dimension of 10-1/4” with a depth of 4-1/4”. You can even make cardboard enclosures for these speakers for better bass response although this is up to your personal choice. The ceiling speaker also has Santoprene surrounds which withstands extreme temperatures and moisture, making them ideal for bathrooms, outdoor patios or areas at home with moisture and dampness. We would not recommend however placing these speakers in direct contact with rain or water as this may damage the speaker’s internal circuitry. The manufacturers do provide warranty to go with these ceiling speakers which shows just how much they stand behind their products. The Verdict? The OSD weatherproof 8” ceiling speakers are a solid set of speakers that deliver really good sound performance in a full moisture resistant enclosure. They are designed to survive moisture and damp conditions and are suitable for installation in bathrooms, outdoor patios or kitchens. It is made of solid materials that can withstand extreme temperatures and prevent hardening or cracking. We were quite surprised at the sound quality of the OSD speakers – they produce really nice highs, very good midrange with plenty of mid-bass impact and good bass response from the 8” cone woofer. The bass impact that you get with these speakers is really strong and powerful; you can also tweak the EQ settings from your stereo receiver if necessary to suit your room environment. Installing these speakers was a breeze and they blend in relatively well into modern home décor with a low profile design. 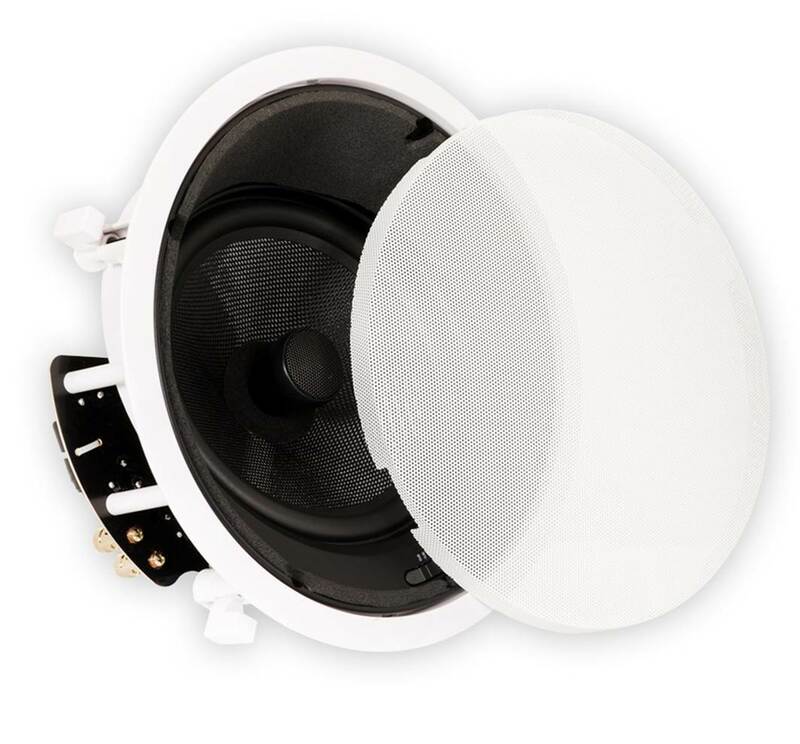 Overall, the OSD weatherproof 8” ceiling speakers are some of the best ceiling speakers you can find for moist and damp home environments and come highly recommended. The JBL SPCII 2-way ceiling speakers are some of the best ceiling speakers you can find that deliver crisp and sweet highs. The SPCII speaker is specially designed with a titanium laminate tweeter for excellent high frequency sound reproduction, with nice extended highs and a detailed level of sparkle to the overall music performance. It comes equipped with rubber surrounds which reduce distortion and provide enhanced durability. The speaker also comes with dog-ear brackets which it possible for retrofit applications. The SPCII also comes with faceplates and grilles which can be painted to match the room interior décor. It also comes with a swivel mount tweeter which you can adjust to direct the sound projection to achieve a much better soundstage in your room. If you are looking for one of the best ceiling speakers with really crisp and nice extended highs, the JBL SP6CIIs are definitely the ones you should check out. The JBL SP6CIIs produce really clean sound with detailed highs and decent midrange. They are really easy to install and work well when integrated into a 5.1 or 7.1 system as front or rear speakers. The sound quality that you get with these speakers is crystal clear; vocals and acoustic performances sounded natural and organic without any hint of coloration. They have pretty faithful sound reproduction. The highs are really bright with a nice layer of sparkle which makes them really good with smooth dialogue and music performances. When connected to a decent home theater receiver, the SP6CIIs produce very good quality sound with deep sound effects. Vocals sound crisp and clear, and you can pick up details in the soundtracks which you might not have noticed before. Watching movies with the SPCII speakers as rear speakers will really bring good surround sound effects to your living room. The tweeters have the capability to pivot somewhat which allow you to adjust the soundstage and create a nice sonic image with these speakers. In terms of audio clarity, it’s hard to go wrong with the JBL SP6CIIs. Installing the JBL SP6CIIs is a really simple and straightforward process. It features a really nice and minimalist design that fits in really well into home ceiling or walls without being too obtrusive. The speakers also come with faceplates and grilles which can be painted to match the room décor color. Do note that you might need to cut a hole slightly larger than the hone size with the given template to insert the speaker into the ceiling. We also found that removing the grille from the speaker may be pretty challenging – while the ceiling speaker comes with a paper tab tucked under the speaker grill to allow you to remove the grill easily, it may tear off if you use too much force. If this happens, you might want to use a screw driver to take off the grills which might pose some inconvenience. The speaker has nice rubber surrounds which reduce overall sound distortion from the speakers. Overall, the SPCIIs are a really durable and high quality set of ceiling speakers that definitely deserves a closer look. The Verdict? The JBL SP6CIIs are a really good set of ceiling speakers that excel in deliver crisp highs and very good quality sound. They are some of the best ceiling speakers you can find reproduce sound dialogue and vocal performances with pristine clarity. That being said, these speakers do lack bass response and will definitely benefit from the addition of a dedicated subwoofer to the ceiling speaker setup. The SP6CIIs are pretty much easy to install and you will need to connect them to your speaker wiring through the audio receiver. Do note that you might need to cut a larger hole in the ceiling speaker as compared to the template for easier insertion. The speaker grille is paintable and mounts flush into the ceiling which makes it barely noticeable with a low profile design. They also come with dog-ear brackets for retrofitting applications. Overall, the JBL SP6CIIs are some of the best ceiling speakers you can find that deliver really crisp and clean sound performance and come highly recommended. The Theater Solutions TSS6A is one of the best ceiling speakers you can find with deep bass response and is angled at 15 degrees for directing sound towards your listening area – it is the ideal solution when in wall speakers are not an option and you need to project sound into a living room space or area. The speaker is equipped with a 6.5” interlaced glass fiber 8 ohm driver with durable butyl rubber surrounds rated at 125 watts RMS and 250 watts max. The TSS6A ceiling speaker is capable of producing reasonably good full-range sound with a wide frequency response of 28 Hz to 21 kHz with a 95dB efficiency rating. It is equipped with a 1” silk dome tweeter for extended highs with a 15 degree swivel mount for you to project the soundstage in your living room. We liked the fact that the speaker comes with a cut out template with full installation instructions included for easy reference. If you are looking for one of the best ceiling speakers that delivers high definition sound, the TSS6A 6.5” ceiling speaker comes highly recommend. When we tested the TSS6A ceiling speakers, we were quite impressed with how detailed the sound quality was without any harshness or recessed midrange. The speaker works great in home theater setup or in a surround sound system and produces full bodied sound with decent bass response. It has a rather wide sound dispersion which makes it great for single or multi-room speaker installations. The TSS6A ceiling speakers have a very full sound quality and when we played electronic dance music and classic rock through these speakers, we got pretty deep bass response with plenty of mid-bass ranges. The TSS6A can go low up to 28 Hz which helps improve the bass frequencies although it would definitely benefit from the addition of a dedicated subwoofer. The music that these speakers produce is punchy and hits hard; they really get the bass beats right and produce a really solid sound performance. When we paired these ceiling speakers to our home theater receiver, movies sounded cinema-like with plenty of deep sound effects and good details that spread across the entire room. If you are looking for an angled wide-dispersion ceiling speaker that has good bass, the TSS6As are definitely the ones you should check out. The TSS6A ceiling speakers have a rather sleek and minimalist design that blends in nicely into modern home décor. The speaker can also be used as front, rear or center channel speakers in a surround sound speaker setup. They are also constructed with high quality moisture resistant materials which deliver really good sound quality and durability. These speakers are designed to be self-mounting and come with a swing-out dog leg mounting system for ease of installation. It also comes with paintable white aluminium grills that offer good rust protection from moisture and damp conditions such as bathrooms and outdoor patios. The 6.5” cone and butyl rubber surrounds are rigid and deliver good power handling without any distortion. The ceiling speaker also comes with a three position tweeter switch which allows you to adjust the treble response according to your room acoustics. It also has a 18dB per octave crossover which provides consistent tonal quality when playing music through these speakers. The Verdict? The Theater Solutions TSS6As are hands down some of the best ceiling speakers you can find with good angled wide dispersion and bass response. The bass on these speakers hits hard and feels pretty solid down to 28 Hz, although you might want to get a dedicated subwoofer into the system for a more powerful low end kick. The speaker produces crisp highs and detailed midrange with very good vocal reproduction and smooth instrumental notes; the sound coming from these speakers feels very organic and uncolored. They feel very crisp with a nice mid-bass punch and are great for bass-heavy genres. They work really well when integrated into a home theater system setup as front, center or rear ceiling speakers. Installing these speakers was rather straightforward although you might need to cut out a much larger hole as provided in the template for ease of installation. They are some of the best ceiling speakers that deliver exceptional value for money and we highly recommend checking them out. The Klipsch CDT-5650-C are one of the best ceiling speakers of the Klipsch line that deliver exceptional value for money. They are easy to install and produce very good sound, and have premium speaker specifications usually found only in high end audio drivers. 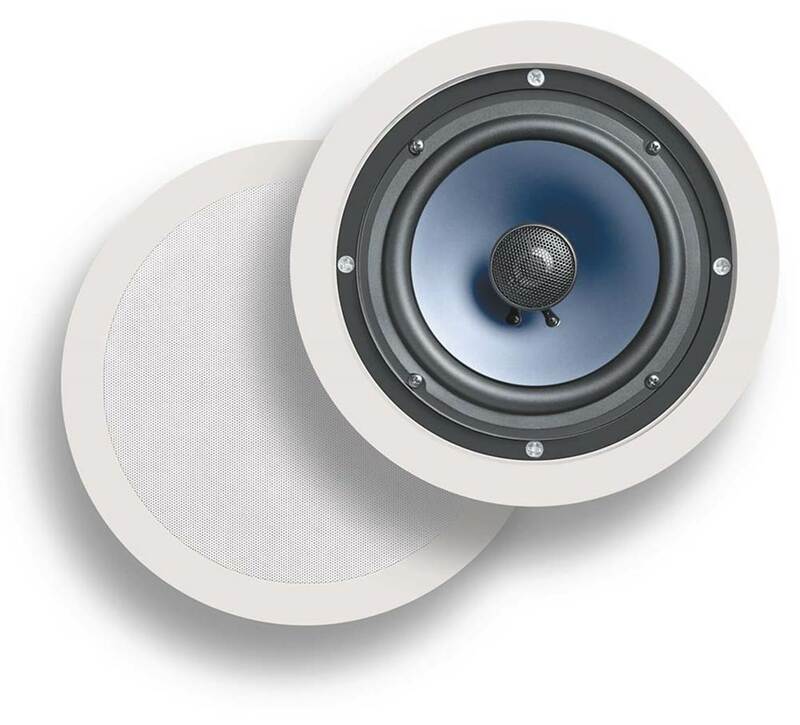 These ceiling speakers were designed to meet the demand for a high-performance ceiling speaker that easily challenges the limitations of fixed locations. It incorporates a gimbal mechanism or Controlled Dispersion Technology (CDT) with allow both the high and low frequencies of the CDT-5650 can be directed towards listening areas to create excellent soundstage. It comes equipped with a 1” titanium tweeter for sweet extended highs, a 6.5” pivoting cera-metallic woofer for deep lows and features treble and midbass attenuation switches for you to adjust the sound according to your room environments. On the whole, the CDT-5650s are some of the best ceiling speakers you can find for audio fidelity and we highly recommend them. When we tested these Klipsch speakers, we were quite blown away by the sound quality and fidelity. We tested these speakers along with a pair of R-5650-W in-wall speakers next to it. Taken together as a whole, they create a nice sound stage for music in the house with crisp vocals and detailed sound perfomrance. That being said, they need a quality 100 Watt amp to drive well and play quality music. We found that installation of the speakers a breeze – simply install these as you would a normal pair of ceiling speakers. Once connected to the amplifier and linked to your 5.1/ 7.1 system, you’re all set and good to go. The sound on the Klipsch ceiling speakers are phenomenal and drive up to 50-watts (200-watts peak) of power, which means it can get very loud. The sound is crisp and accurate, and has good emphasis on the mids and lows. It produces more bass than you would expect from a conventional ceiling speaker; we were actually quite surprised at how well these speakers performed, provided that you hook it up with the right amplifier. The sound did not distort at high volumes at all; these speakers made watching movies come to life with cinematic effects heard throughout the house. We were quite enthralled when we tested these. The CDT-5650-Cs also boosts an impressive array of specifications that are usually found only in high-end speakers. The tweeter is independently adjustable from the woofer to allow the speaker to provide an even more precise localization of sound; it is mated to a swivelling 100-degree tractix horn. We found that the swivelling horn design dramatically increases efficiency by enabling the speaker to produce more output using less energy. Additionally, a horn-loaded tweeter works well in instances where you want to point the sound to a specific location because it has more controlled directivity than a conventional dome tweeter. The speaker also features an impressive 6.5” cera-metallic woofer which can rotate a full 360-degrees and shift 15-degrees in any direction. This flexibility combined with the swivelling tweeter puts you in complete control of where the sound will go. The Verdict? While the Klipsch CDT-5650C is on the pricier end of the spectrum, they are some of the best ceiling speakers you can find for higher end ceiling speaker setups. They deliver exceptional value for money and deliver really good audio performance with great audio fidelity. Music performances are reproduced with distinct clarity and with nice extended highs. Furthermore, the sound that these ceiling speakers produce is one-notch above conventional ceiling speakers, with the added functionality of adjusting your woofer and tweeter to create a vibrant soundstage for home theatre. It is a speaker that is made of good quality components and is durable enough to last for a long time. All these factors combined with the meticulous attention to detail makes the Klipsch speakers one of the best ceiling speakers you can find on the market. The Leviton AEC80s are one of the best ceiling speakers available in the market and produce some of the best soundstage and detailed sound we have heard on this list. 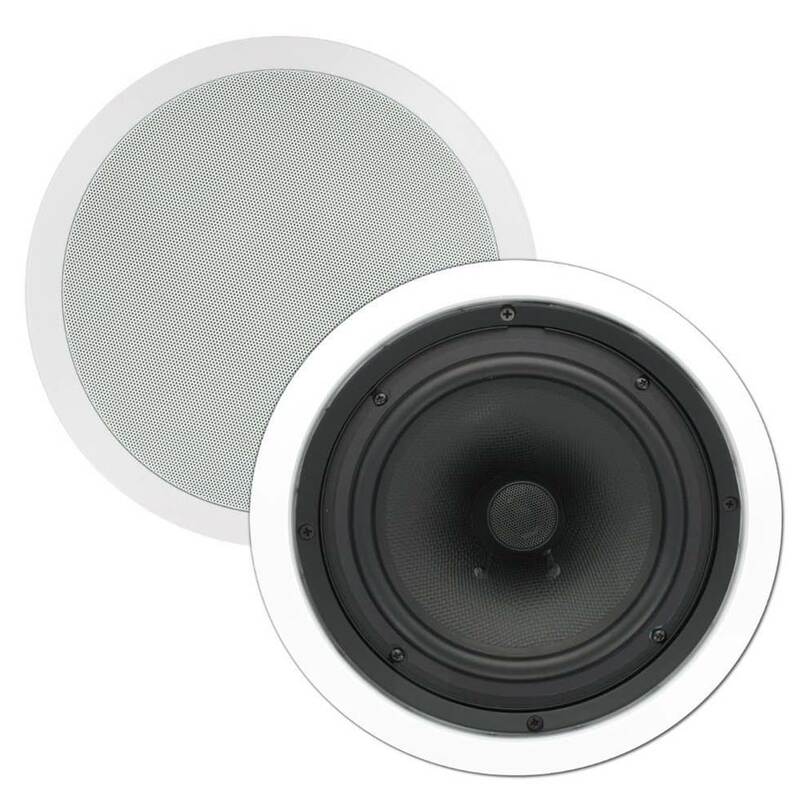 They come as a pair of 8” two-way in ceiling speakers rating at 100 watts at 8 ohms and are really easy to install. These professional ceiling speakers are designed with every detail in mind; they are excellent quality speakers equipped with JBL drivers and movable concentric tweeters and built-in crossovers that delivers a stunning audio performance. We also found that the AEC80s work and articulate very well with other speakers (combined with a Klipsch 10 inch subwoofer) to make an exceptional theatre experience. It also features a low-diffraction swivel-tweeter mounting system for optimum stereo imaging and long-excursion woofers that maximum the overall bass impact. If you are looking to create your surround sound setup with the Leviton AEC80s, you will definitely be impressed by its dynamic and crisp sound. Essentially, the AEC80s combine JBL knowhow and technology with the durability of Leviton products. These ceiling speakers are equipped with JBL titanium-laminate drivers for maintain musical accuracy and clarity even at low frequency levels. 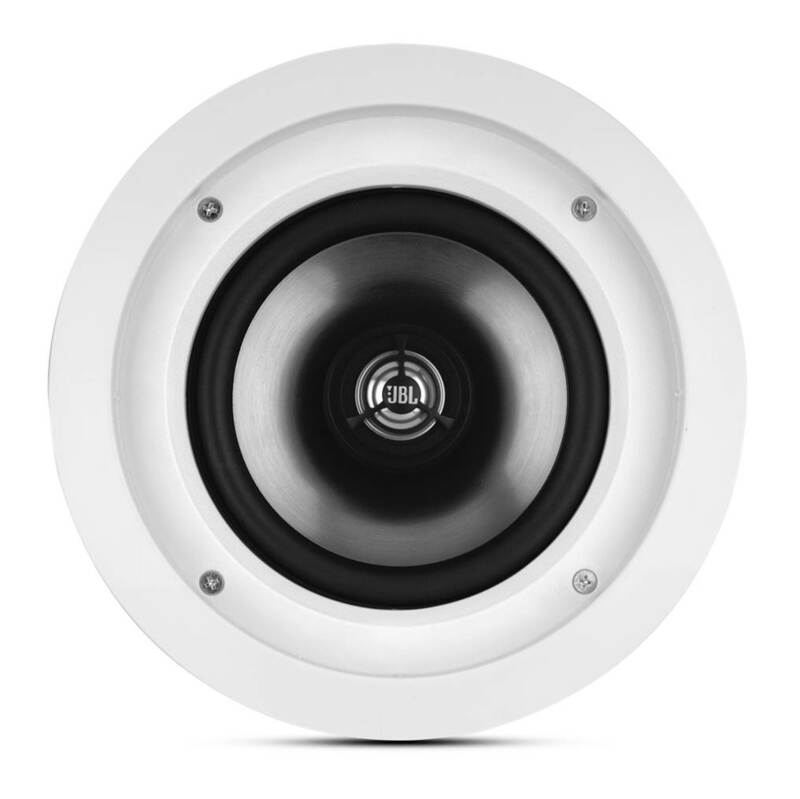 With a straight single line path crossover network, these in-ceiling speakers get the least among of signal distortion to minimise audio interference. Furthermore, the Leviton Architectural Edition feature heavy-duty input terminals for long-term connection integrity, coupled with integrated mounting brackets which increase its stability and durability. The long-excursion woofers with butyl-rubber half-round surrounds and extended pole-piece magnetic structures provide maximum bass impact and dynamic range. Apart from these impressive technical specifications, the AEC80s has a power handling capability of 100 watts and an audio sensitivity of 89 decibels. The AEC80s features acoustically transparent paintable baffles and grilles to fit with your home décor. All these value-added features are backed by a two year manufacturer’s warranty. Finally, we really liked the acoustically transparent grills which help to conceal this speaker when installed – we note that this design was inspired by JBL’s years of professional experience in theatre sound systems. If you are fussy about room aesthetics, the Leviton AEC80s may be used in surround-sound installations which will be barely noticeable after installation. The JBL low-diffraction swivel tweeter also makes it convenient for you to optimize the sound field for a particular listening room’s geometry. This means that you can adjust the direction of the sound to suit your home theatre purposes, giving plenty of customization options. The Verdict? The Leviton AEC80s are one of the best ceiling speakers you can find produced by JBL in conjunction with Leviton that delivers sound performance that surpassed our expectations at this price range. The level of detail and soundstage that you get with these speakers is just worlds apart from other conventional ceiling speakers. Apart from the wide range of technical specifications included in this speaker, we felt that the overall sound performance was simply superb and acoustically compatible with higher end sound systems. It is the kind of ceiling speaker you would want to include in a high end home theater setup. The bass impact on these bluetooth ceiling speakers was also particularly good. We are confident that the Leviton AEC80s are some of the best ceiling speakers you can find that will take your audio listening experience to the next level and we highly recommend them. The Bose 791 in ceiling speakers are some of the best ceiling speakers you can find that deliver stunning full range sound performance and crystal clear highs. 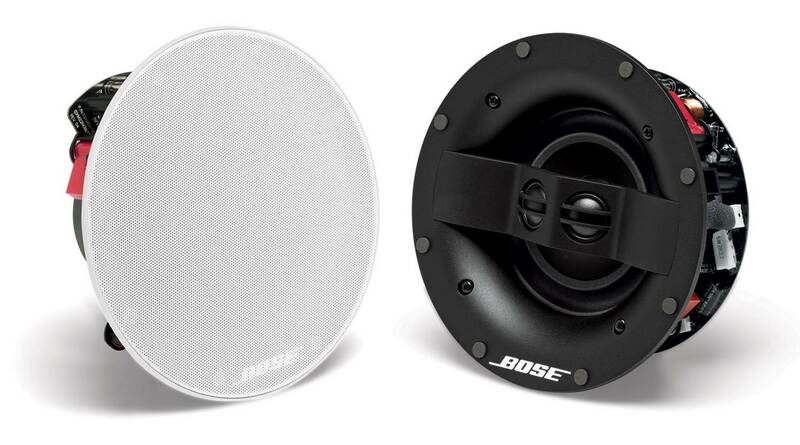 The Bose 791 ceiling speaker comes equipped with one 7” woofer and two well positioned 1” tweeters for deep bass response and crisp extended highs. They are high quality speakers that can deliver full range sound performance that rivals that of high end ceiling speakers. The Bose speakers also have excellent sound projection which covers the entire room with balanced stereo sound without any distortion or drop offs. It has a really rigid and solid construction that blends into modern home décor; it also comes with paintable grilles for easy mounting and setup and clip on and off with magnets. While these speakers are quite costly, they are some of the best ceiling speakers you can find in the market and are definitely worth the investment if you are looking for a quality set of ceiling speakers. The sound performance of the Bose 791 ceiling speakers is incredibly detailed, powerful and punchy. It has a nice frequency response between 40 Hz to 16 kHz and produces really good full range sound; they can fill up an entire room with rich and filling sound and reproduce pretty good low end bass response. When paired with our stereo receiver, we were blown away by how detailed these ceiling speakers sounded – vocal performances were reproduced with distinct clarity and with great attention to detail. Orchestra performances sounded very spacious and wide with nice crisp details and good sparkle; it provides decent soundstage which allows you to appreciate where the music is coming from and gives a good sense of spatial imaging. The two 1” tweeters really do a good job in dispersing the sound over a much wider area. The speakers produce full range sound and cover pretty much the entire sound spectrum with detailed clarity and accuracy. From a pure listening perspective, it is pretty much very difficult to go wrong with the Bose 791 ceiling speakers. We were very impressed by how clean and crisp the sound coming from these speakers sounded and they fit in really well with our room design. The Bose 791s are relatively easy to install once you have run the wiring through your ceiling to the receiver. The speaker comes with a solid and elegant construction that blends in very well with modern home décor and is barely noticeable once you put the grilles on. The grilles are paintable to suit the color of your room and magnetically attach to the speaker so you don’t need advanced mounting equipment to setup these speakers. The Bose 791s also come with dogleg clamps for quick installation; it has a diameter of 10” and a depth of 4.4”. They are also really good speakers to include in your 5.1 or 7.1 channel setup and work equally well as stereo speakers. While the bass response on these speakers is pretty good, we would recommend having an additional subwoofer to boost the low end frequencies if you are into bass heavy music such as electronic dance music and classic rock. The Verdict? The Bose 791s are some of the best ceiling speakers we have encountered that produce really good full range sound. It comes equipped with a 7” woofer for deep low end bass reproduction and two 1” tweeters for sweet crisp highs. They produce really good full bodied sound that sounds enjoyable to listen to for hours on end. They also work well with home theater systems as front left and right or rear speakers for surround sound. It comes with a solid construction that blends elegantly into the room’s design with paintable grilles. The speakers are also capable of dispersing sound over a much wider sound field as compared to other ceiling speakers and are perfect for medium to large sized rooms. If you are looking for one of the best ceiling speakers on the market with superb full range sound, the Bose 791 ceilings are definitely worth a closer look. What speaker wire should I use to set up ceiling speakers? We would generally recommend using insulated 16 gauge UL rated speaker wiring with CL2 or CL3 ratings – CL2 is rated for up to 150 volts while CL3 is rated for up to 300 volts, depending on the power requirements of your ceiling speaker. The wire gauge that you normally use with ceiling speakers should be between 12 to 16 gauge depending on the length of the wire from your ceiling speaker to the amplifier, although the most common would be 16 gauge if you are running wires through a room and not over long distances. Here is a table on the speaker wire gauge you can use for reference. Generally speaking, the lower the wire gauge, the thicker the wire is. Thicker wires are more suited for low impedance ceiling speakers (i.e., 6 ohms) and where you require to run the wire over a longer distance. Thinner speaker wires (i.e., 16 gauge wiring) is better suited if you don’t need to run the wire over long distances and you ceiling speaker has an impedance rating of 8 ohms. The table below shows the ceiling speaker wire gauge you should use and the maximum length depending on your ceiling speaker impedance rating (measured in ohms). While there is no correct answer on what wire gauge you should use, we would generally recommend using 16 gauge wiring for a medium sized room because most ceiling speakers have wiring terminal sizes that usually accommodate 16 gauge wiring. There are some instances where the ceiling speaker terminates are too small for 10 or 12 gauge wiring, so be sure to check the ceiling speaker installation instructions and guides before setting them up. Before installing the ceiling speakers, it is important to check where your speaker wiring would run from and ensure that the ceiling speaker position is wire-accessible. Ideally speaking, you do not want to run your speaker wiring parallel with other wiring as this might cause static distortion and other acoustic interferences which you do not want. We would recommend mapping out your room and speaker positioning to determine how you can create a good soundstage and sound-field in your room environment before installing. This is especially important if your ceiling speakers will form part of a 5.1 or 7.1 home theater setup. Depending on the size of the room, we would generally recommend placing the ceiling speakers approximately 8 feet apart to achieve better sound coverage and an acoustic range. You should also angle the tweeter position of the ceiling speakers to create an ideal soundstage in the center-front of the room where you will be sitting. The key is to achieve a good sound projection towards the end user or a nice sweet spot where you can hear the sound clearly. Once this is done, you should secure the speakers in place and reattach the speaker grilles. The speaker grilles can also be painted to match the color of your ceiling or home interior décor depending on your preferences. It is very important to get ceiling speaker placement right – this is because once you drill a hole in your ceiling it is virtually impossible to change the location of your ceiling speaker unless you are prepared to drill more holes into your ceiling – something that we will not recommend! Should I buy in ceiling or in wall speakers? Whether you should get in ceiling or in wall speakers usually depends on the room size, dimensions and installation constraints. In ceiling or in wall speakers produce really good quality sound when installed correctly, and there are pros and cons to each setup. Generally, you would want to get in ceiling speakers if your room setup does not allow you to install in wall speakers, or the positioning of the in wall speakers are inconvenient to achieve next to your TV or home theater setup. In ceiling speakers generally occupy less space and blend in better with your home décor which makes them relatively unobtrusive. Do note that the amount of wiring that you need with in-ceiling speakers is generally longer than in-wall speakers. Another factor to consider is sound projection. While most in ceiling speakers project sound downwards (i.e., down to a certain area), in wall speakers usually project sound outwards to create a much wider sound-field in your room. The bass response that you get from in wall speakers may be deeper due to its larger container size. That being said, in wall speakers may be slightly tricky to install and mounting a speaker into the wall may be more difficult and complex than mounting ceiling speakers. Furthermore, ceiling speakers gives you more flexible to place your speakers, especially if you are looking to install your speakers in the bathroom, kitchen or outdoor patio area. By contrast, in wall speakers are usually suited for the living room area only. It all boils down to personal preference and a good quality set of ceiling speakers that are well installed can sound just as good as or even better than in wall speakers. Most ceiling speakers also give you to option to pivot the tweeter a certain angle to project the sound to a sweet spot. Do I need a sound amplifier? Yes, you will need either a stereo amplifier or home theater receiver to power the ceiling speakers. This is because the ceiling speakers do not come with a built-in amplifier and will need a separate power source to power them. A stereo receiver is ideal if you want to use the ceiling speakers in a 2.1 setup (i.e., front left and right configuration) in your living room and want to focus more on sound quality. How do I use ceiling speakers in a home theater setup? A home theater receiver should be used if you want to pair your ceiling speakers in a 5.1 or 7.1 configuration with other speakers or a dedicated subwoofer. For example, you can have 2 floor standing speakers as the front left and right channel speaker with 2 ceiling speakers as the rear speakers and one center channel speaker with a subwoofer for a full 5.1 setup. There are also setup configurations where you can use ceiling speakers as the front, center and right channel speakers and floor standing speakers as the rear speakers. It depends on your musical preferences as well as the spatial constraints of your room. The key advantage of using ceiling speakers is that you save a lot of space as compared to shelf and floor speakers and can reduce unsightly wiring in your home. What are woofer cones and tweeters used for? You might have noticed that most ceiling speakers come with built in woofers and tweeters. The tweeters (usually 1” tweeters but may be shorter) are designed to produce higher frequency ranges and crisp extended highs. It helps to enhance the timber ranges of your sound frequencies and give your music an extra sparkle. The woofer (usually 6.5” or 8”) that comes in the ceiling speaker are designed to produce low-end frequencies in the low end bass and mid-bass ranges. A good set of ceiling speakers will come with a combination of tweeters and woofers to produce a wide frequency range of sounds and deliver full-range sound performance with a dedicated crossover network.